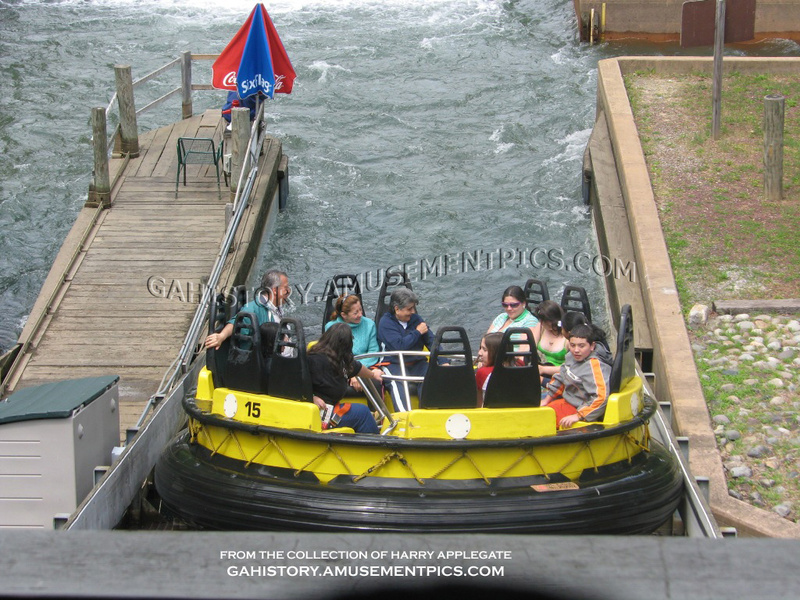 Six Flags worked with INTAMIN to develop a new water ride experience, and the result was a rapids ride which has been duplicated in just about every theme park in the world today. 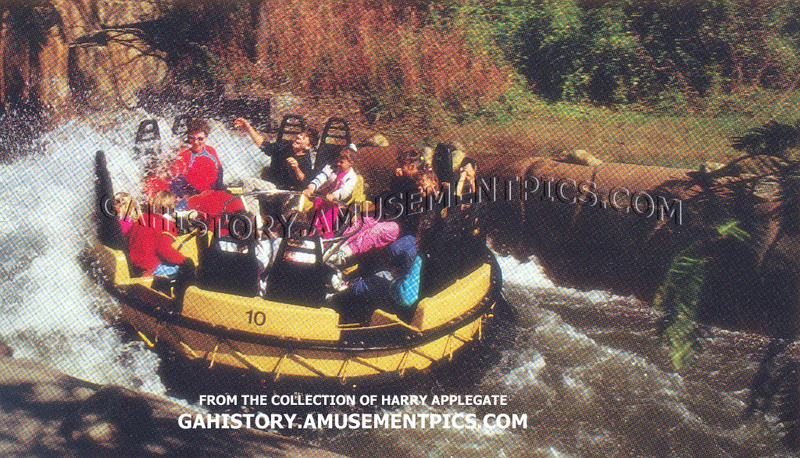 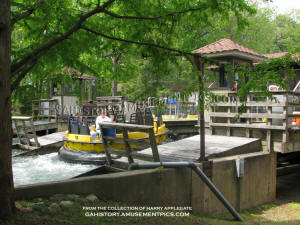 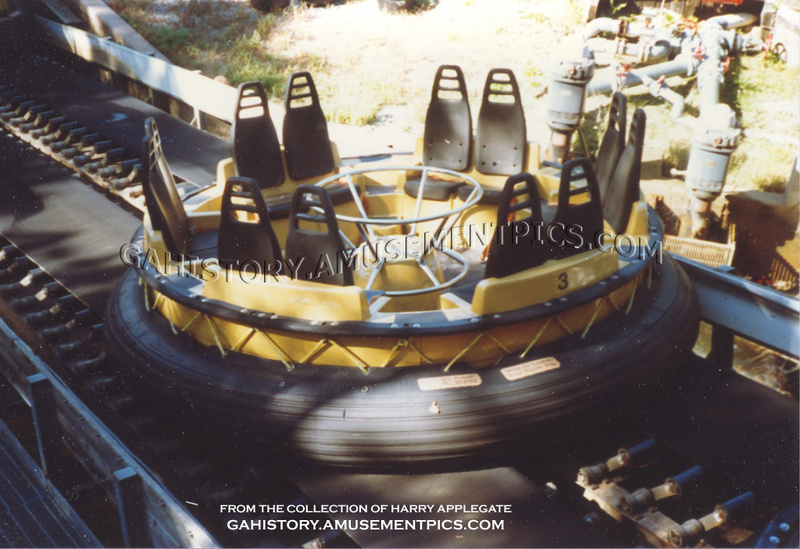 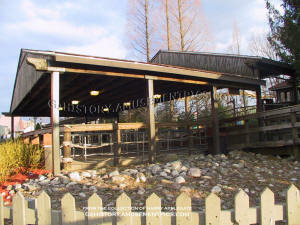 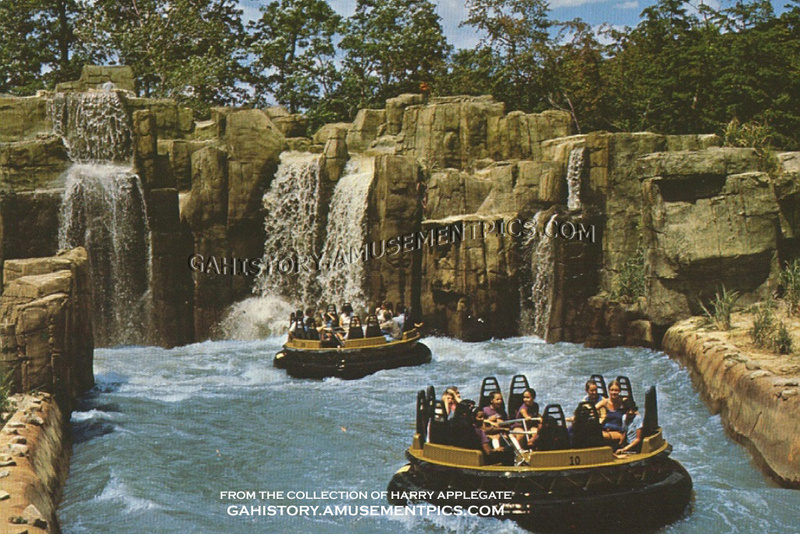 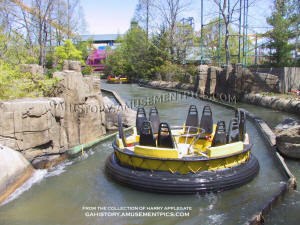 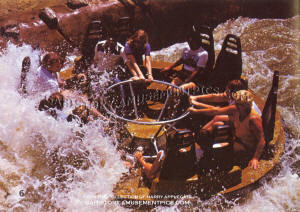 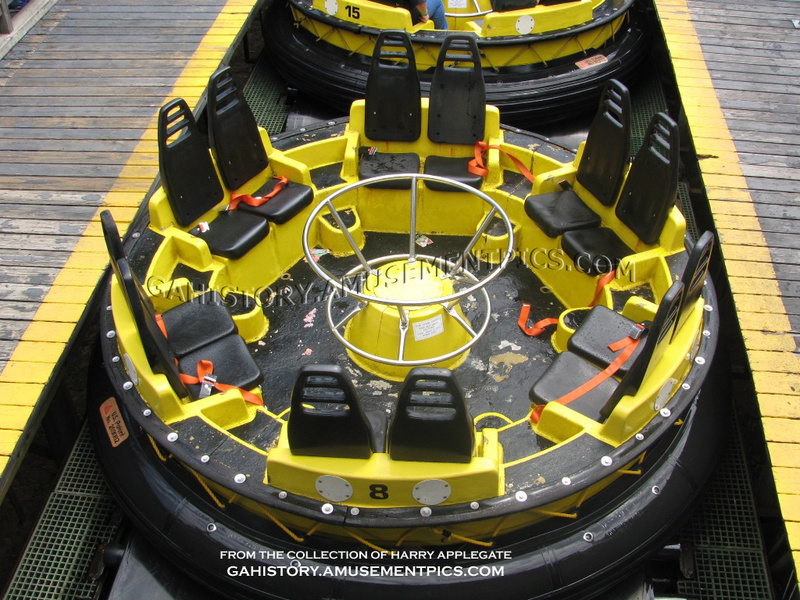 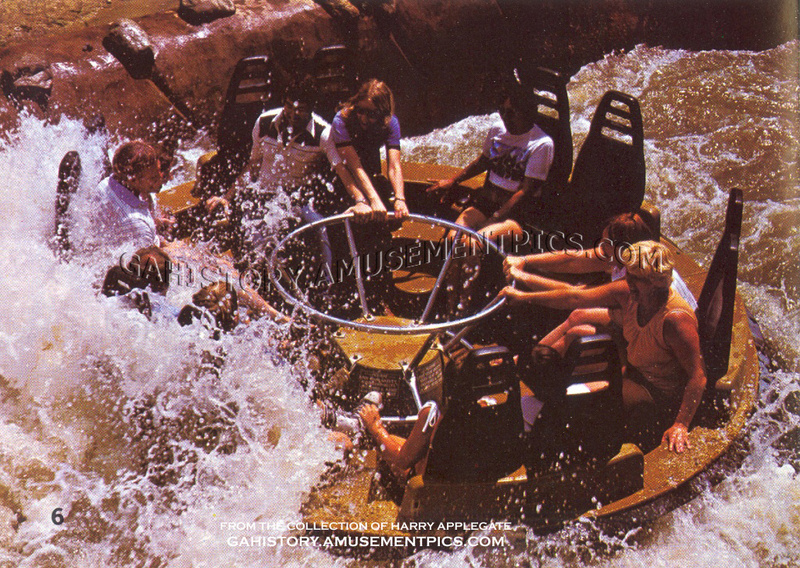 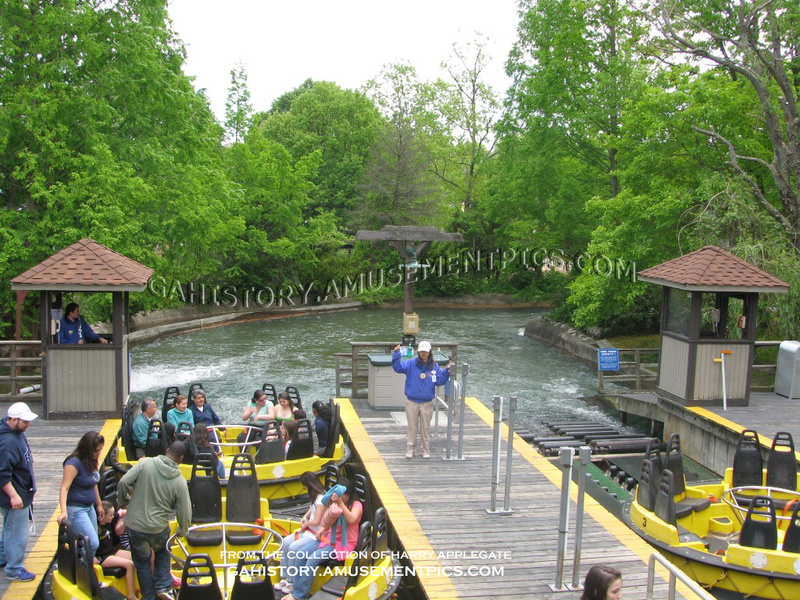 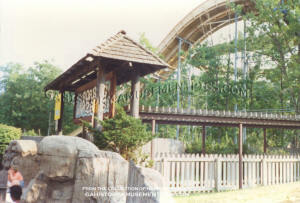 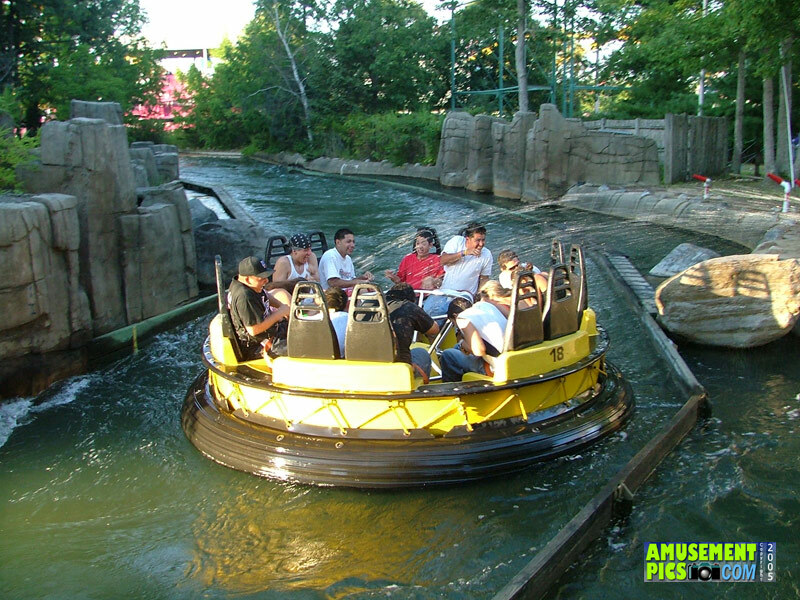 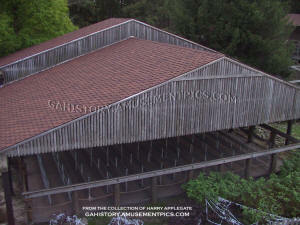 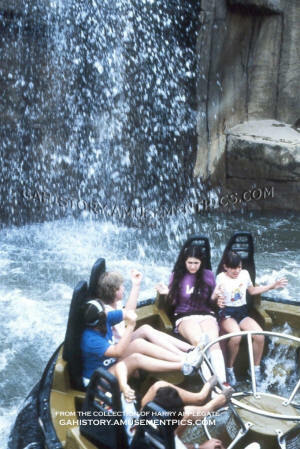 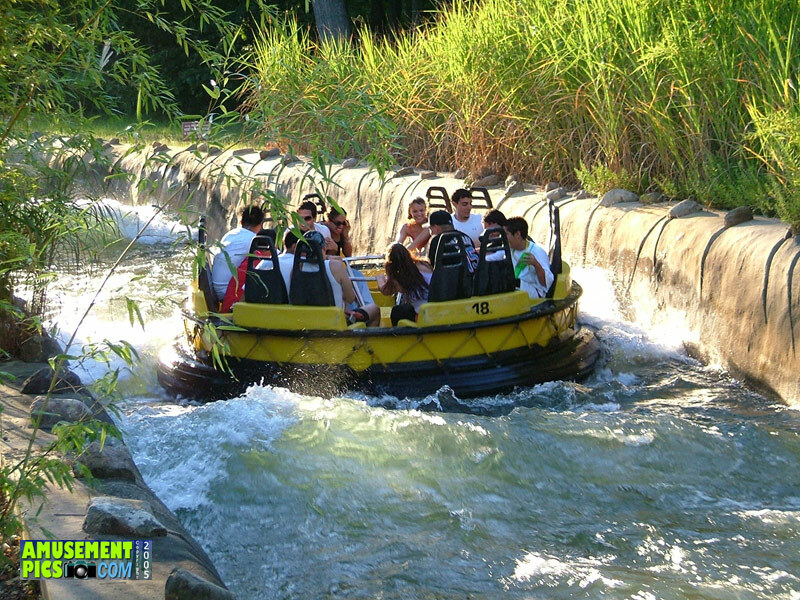 The first rapids ride, Thunder River, debuted at Six Flags Astroworld in 1980, and after its huge success Six Flags looked to install copies of the ride in their other parks, first of which was Great Adventure. 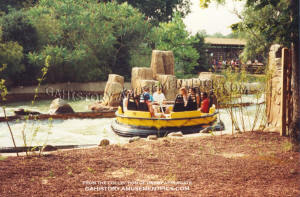 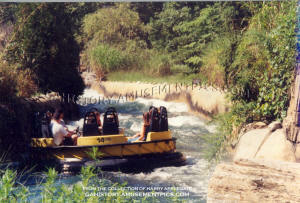 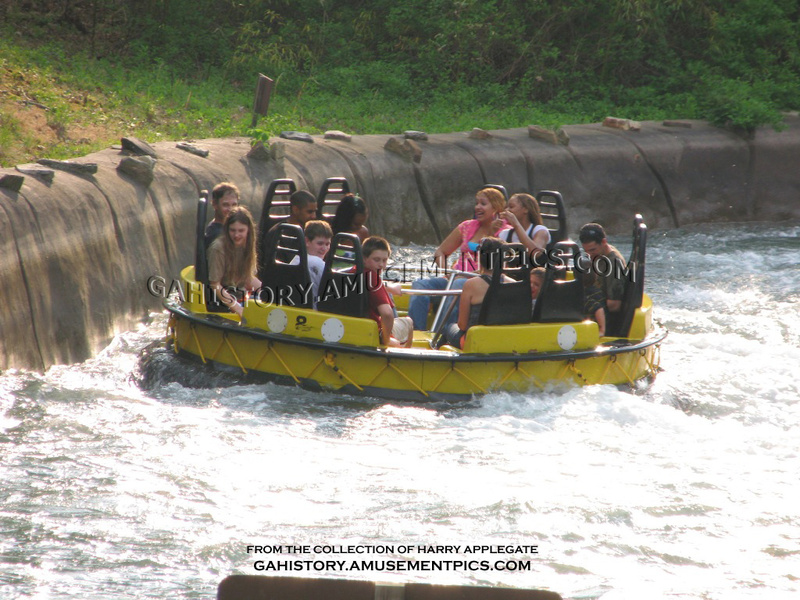 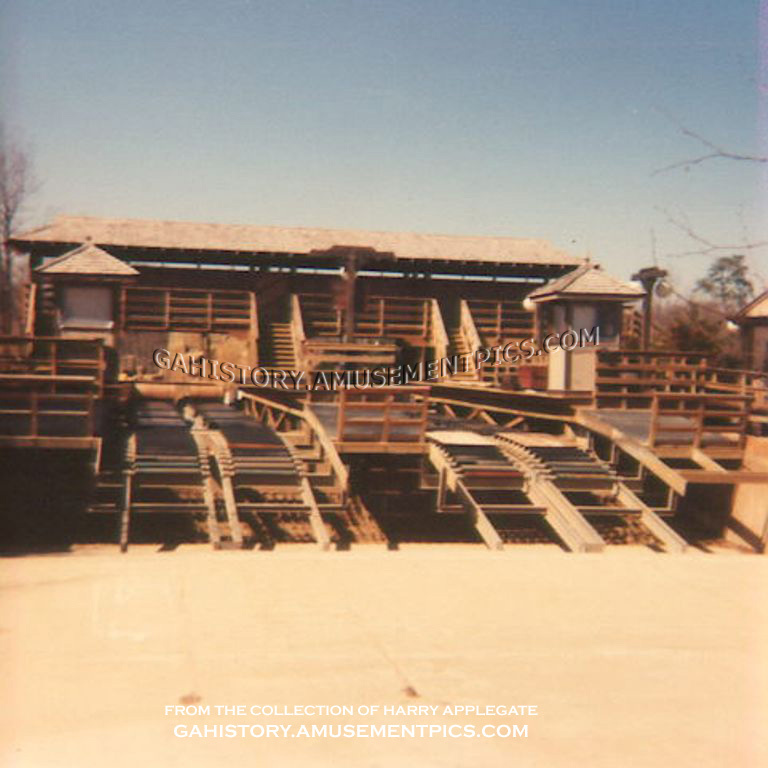 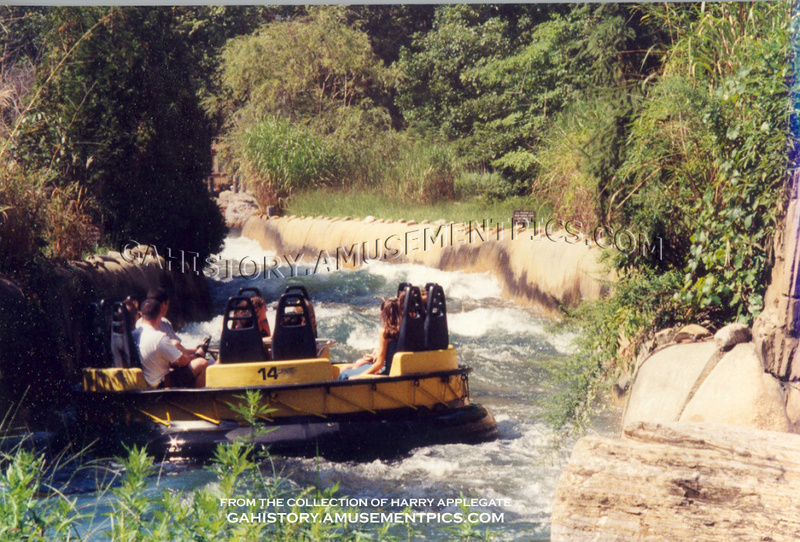 The new Roaring Rapids design expanded on and improved the original Astroworld Thunder River, featuring larger rapids and a longer course which included 2 wave making machines. 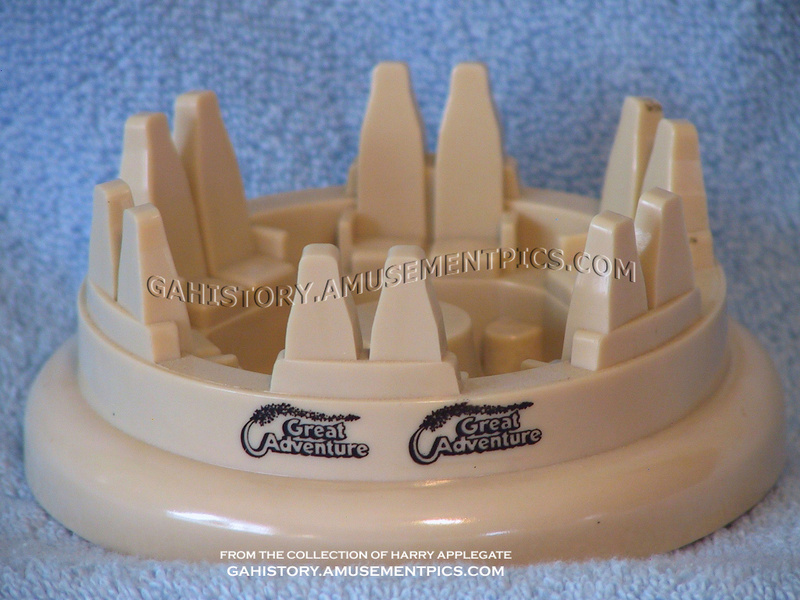 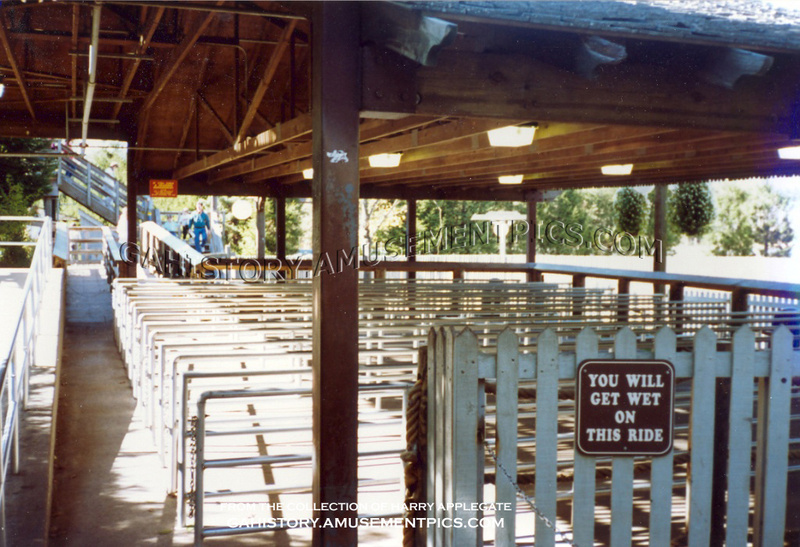 After the initial 1981 season, the ride had features added to ensure guests got wet after complaints from guests that they expected to get soaked, but were disappointed. 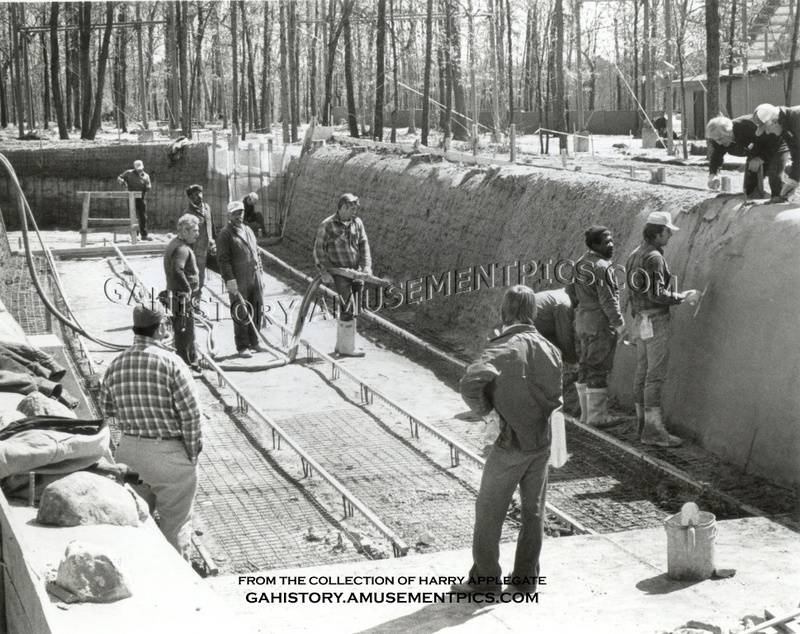 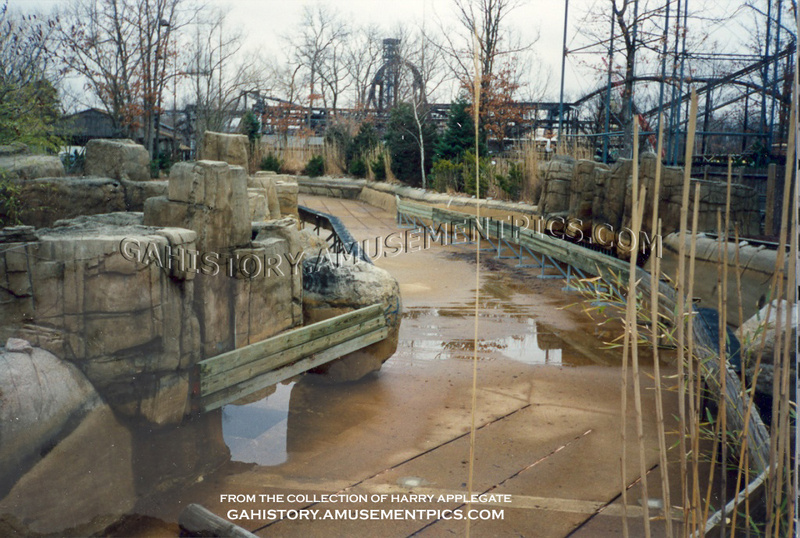 In the 81-82 off season, geysers were added, and a tunnel was planned to have been added but never came to be. 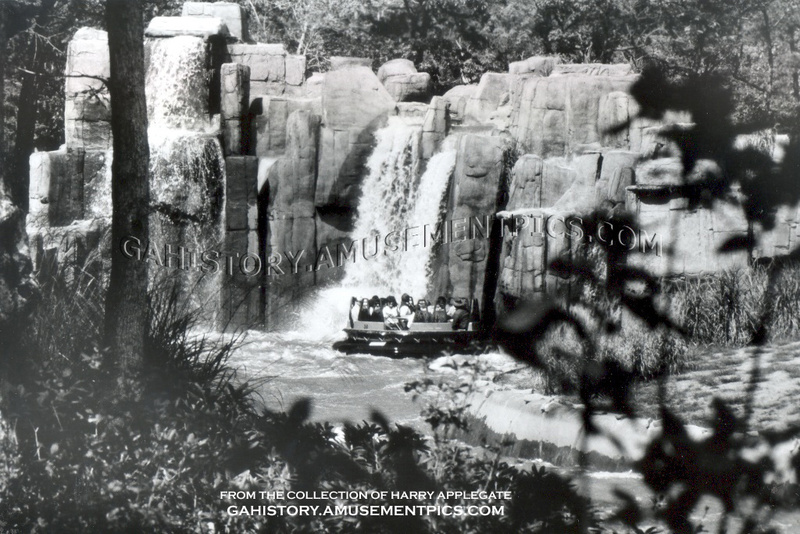 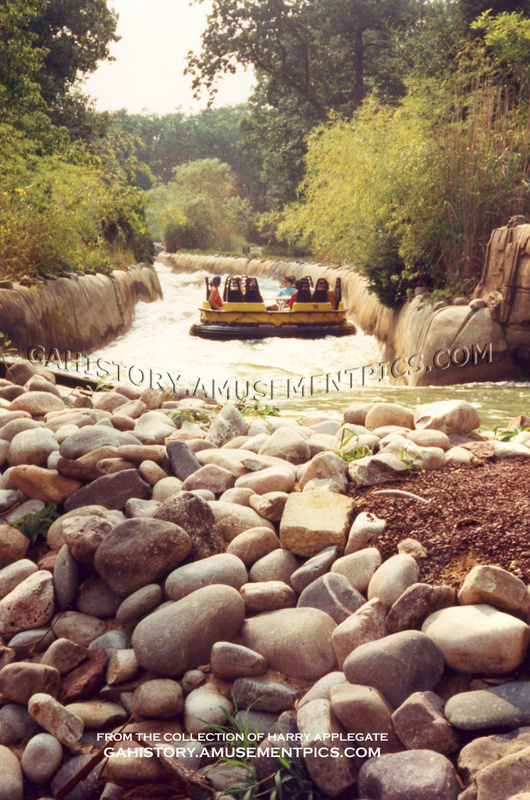 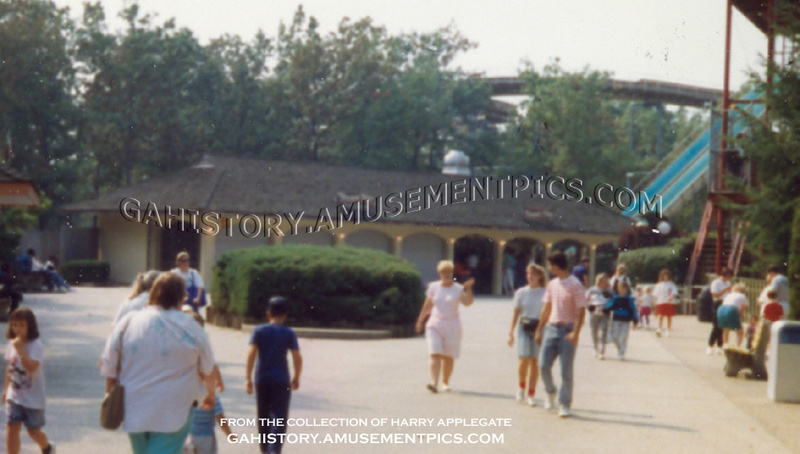 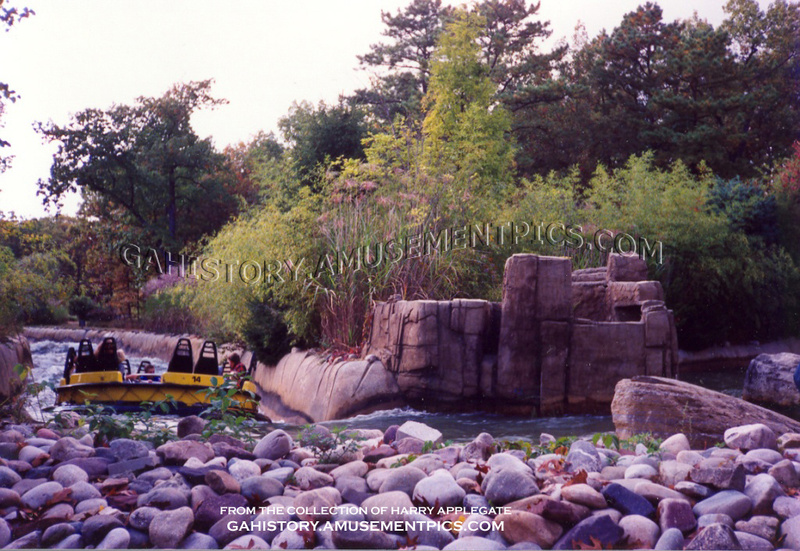 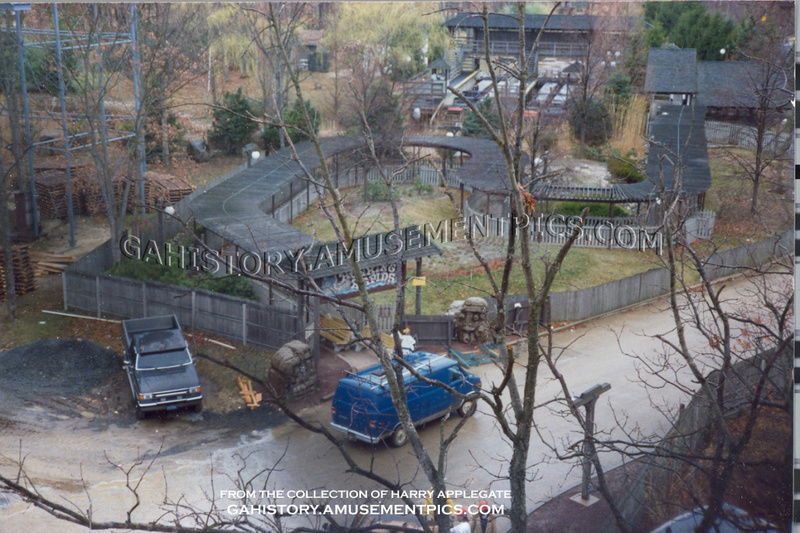 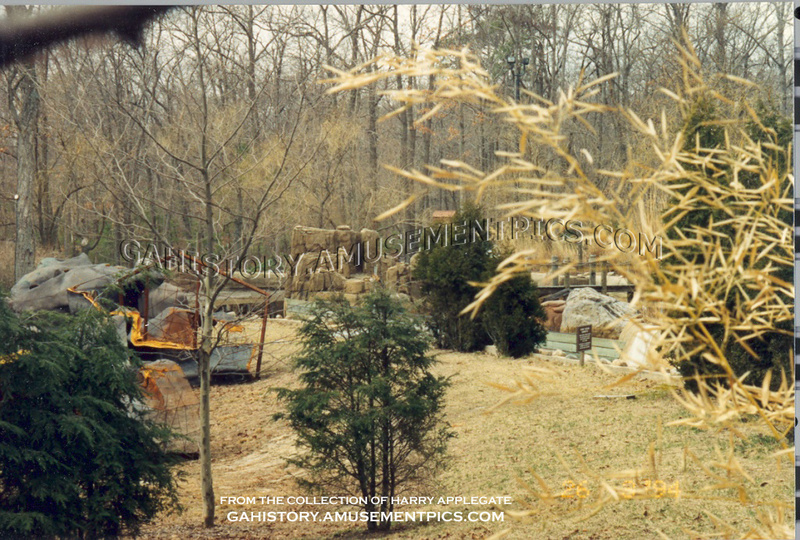 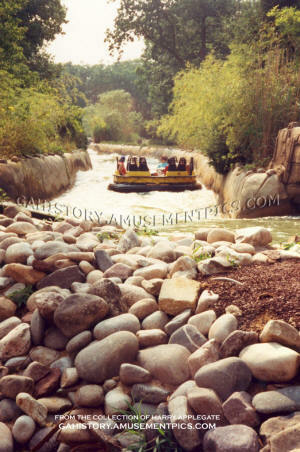 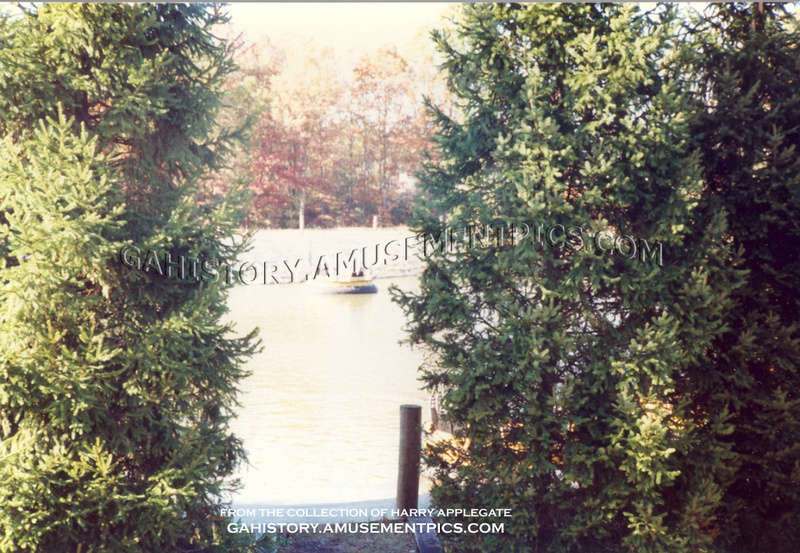 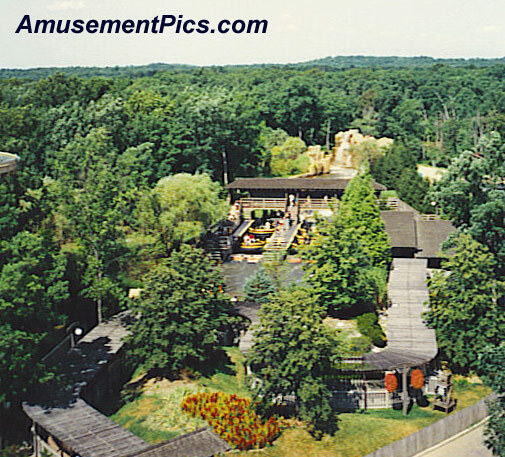 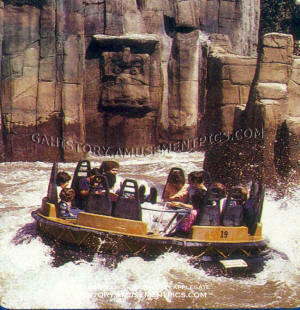 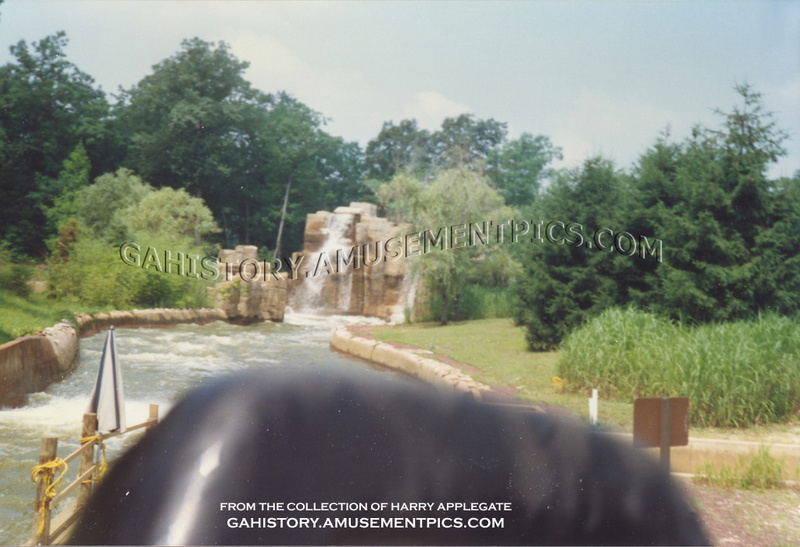 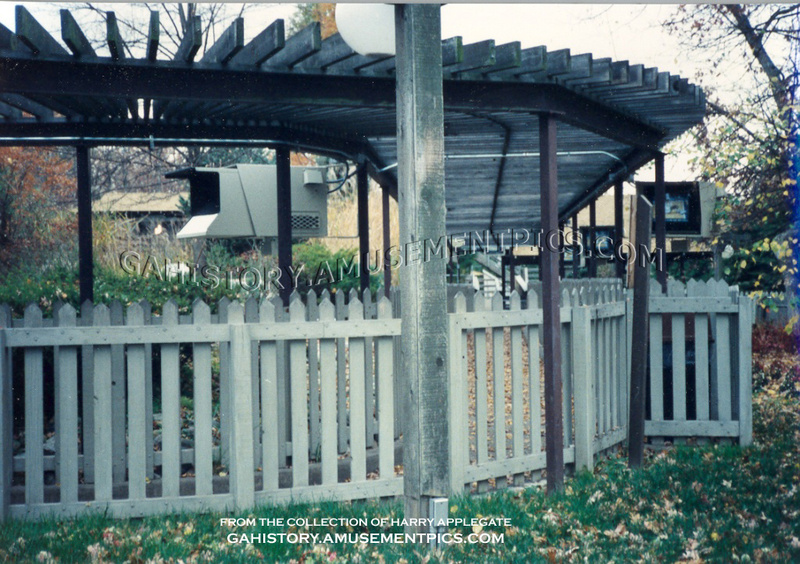 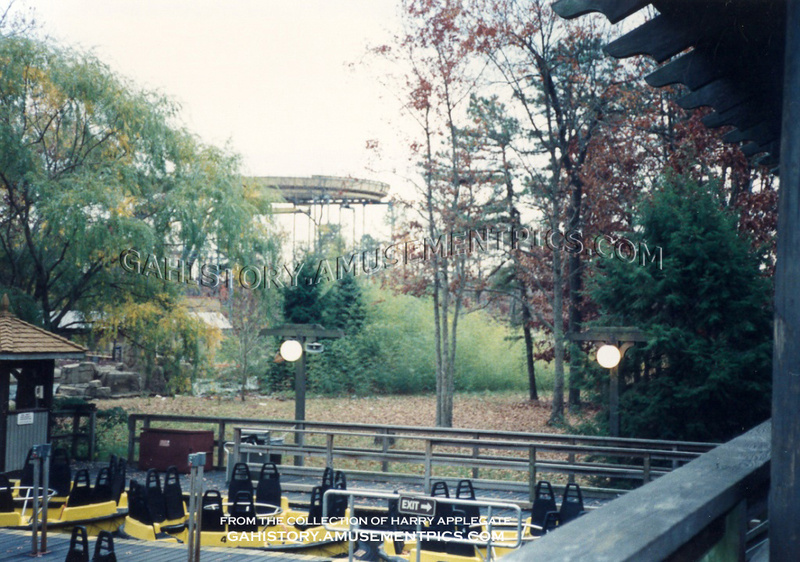 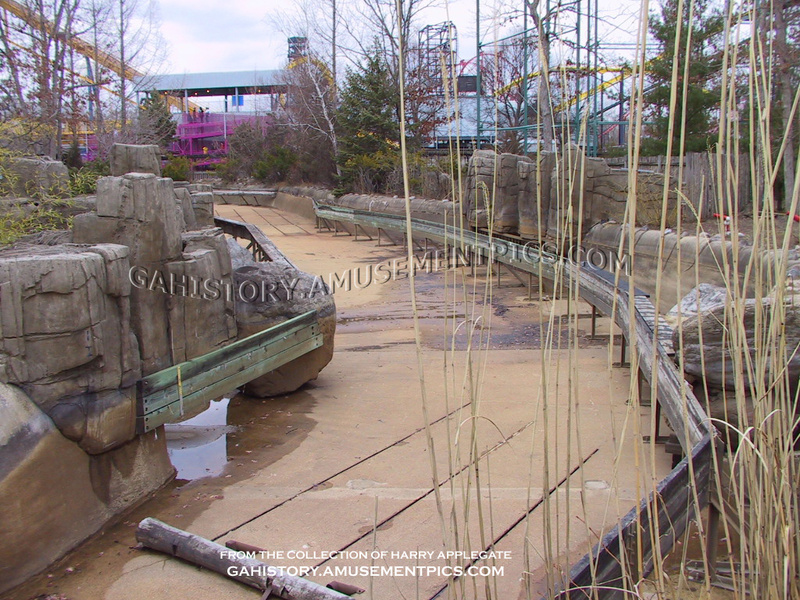 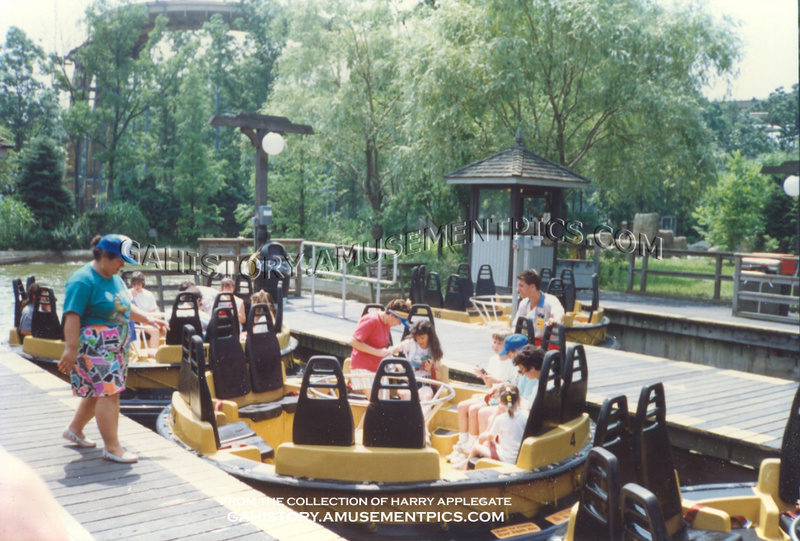 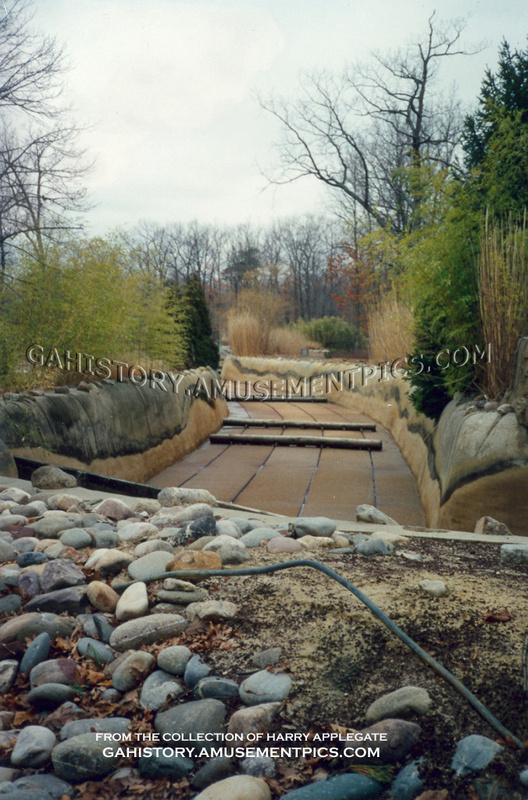 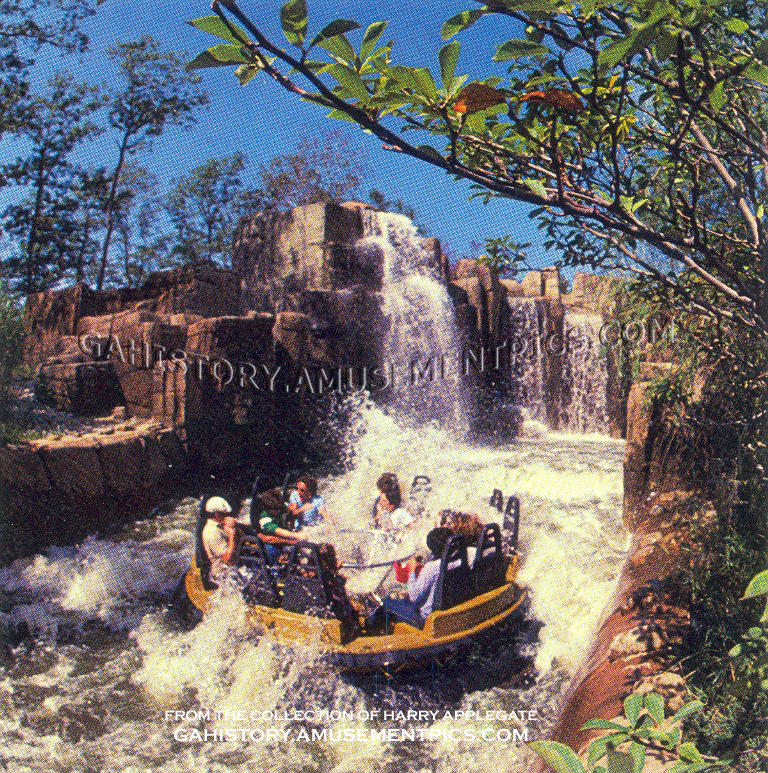 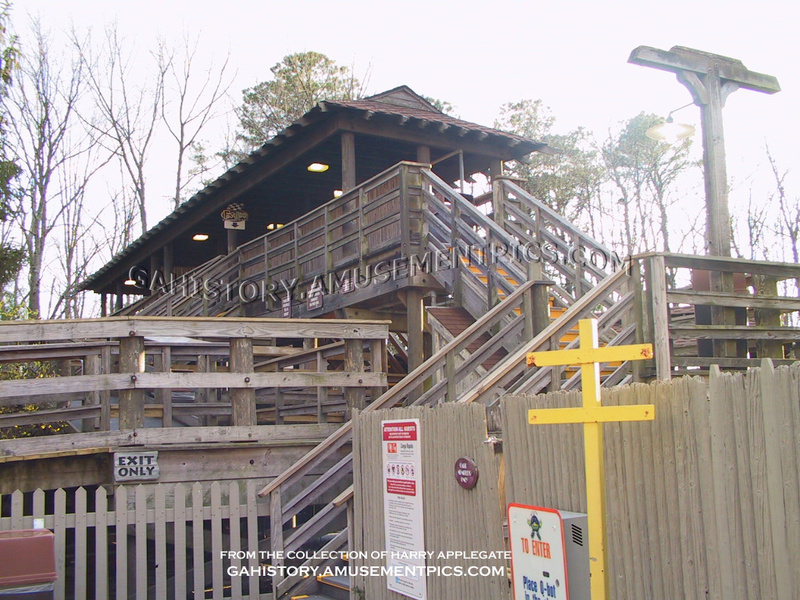 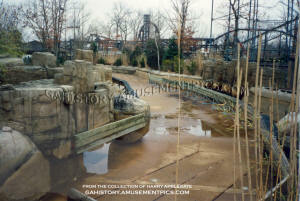 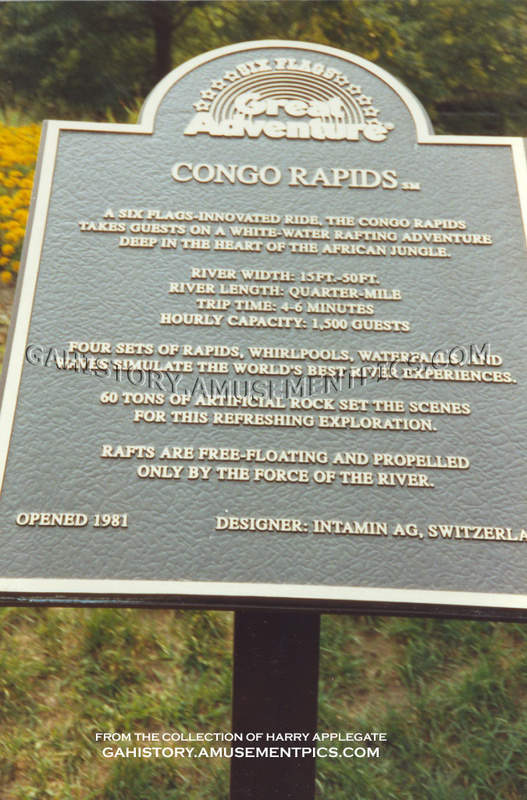 The ride's secluded location was changed drastically in 1991 when the Adventure Rivers section of the park was constructed and the ride was renamed Congo Rapids as part of its inclusion in the new area of the park. 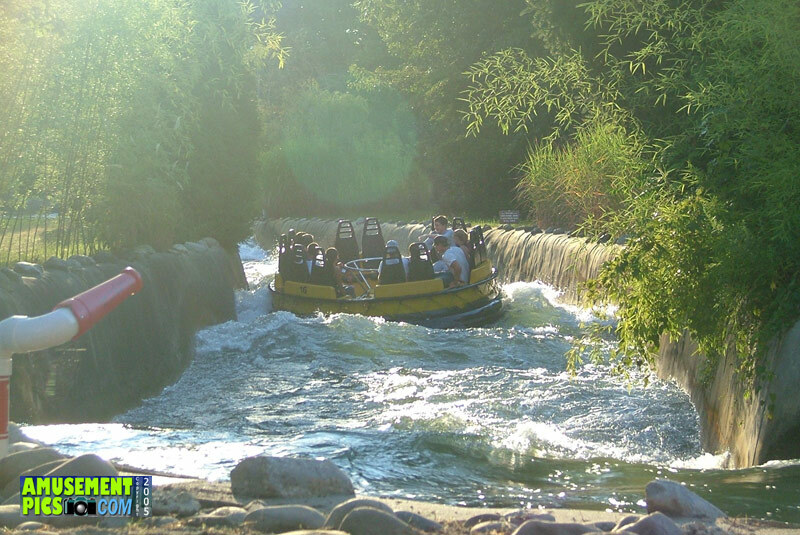 To this day, the ride remains one of the most popular in the park, offering a great way to cool off on hot days, which can be enjoyed by the whole family. 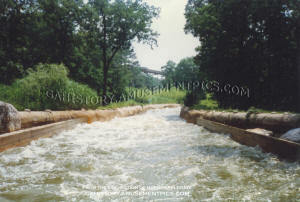 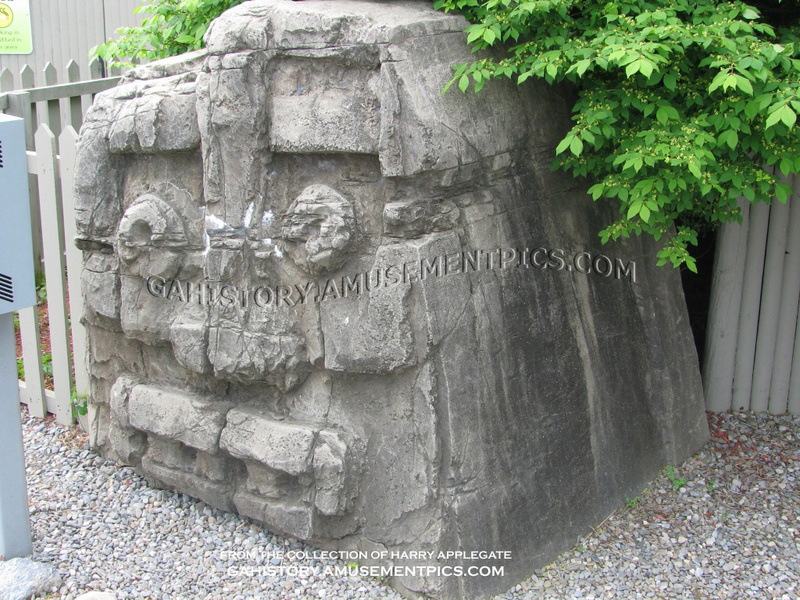 Four rapids created by utility poles on bottom lining of sculptured concrete "river bottom"
Reservoir: Water sourced through Great Adventure's own self contained water well system located on the park property. 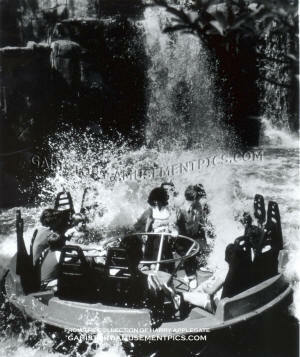 All water for the ride will be re-circulated. 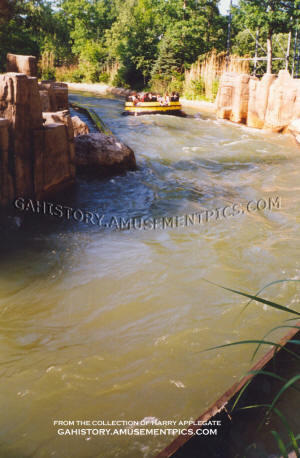 White water to the right. 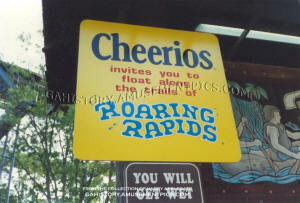 On Great Adventure's Roarin' Rapids ride! 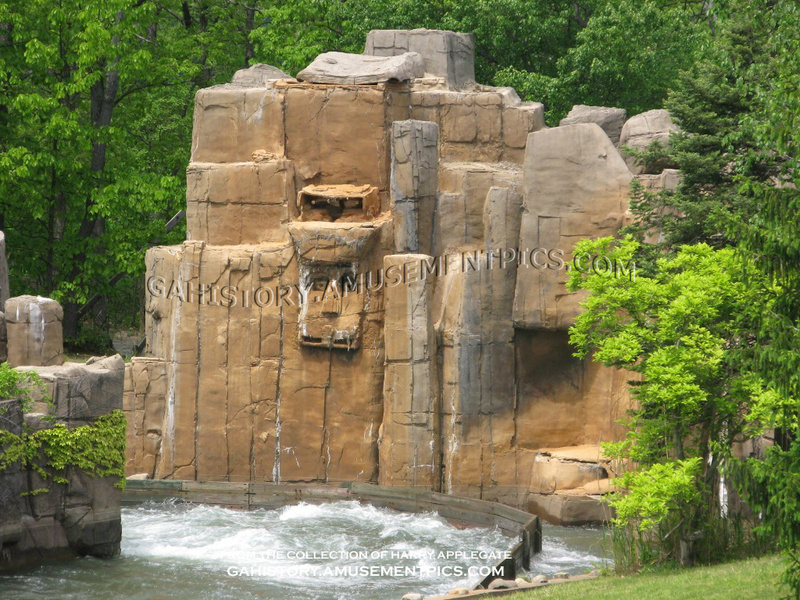 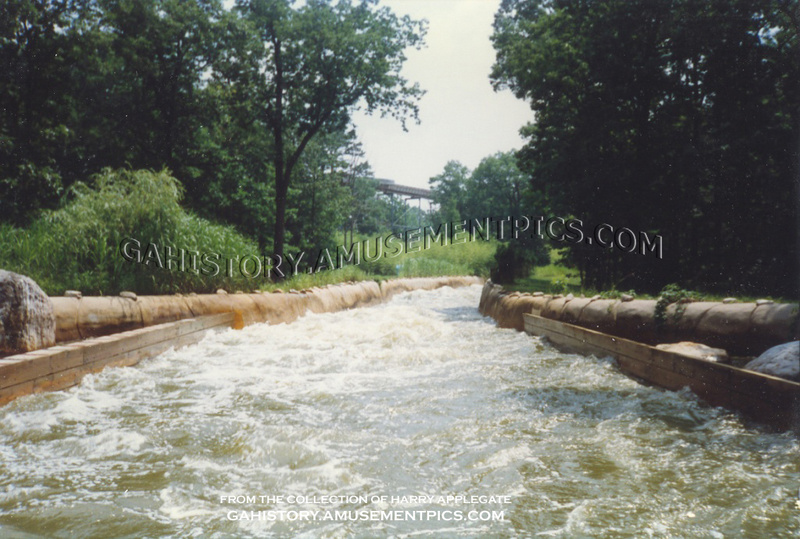 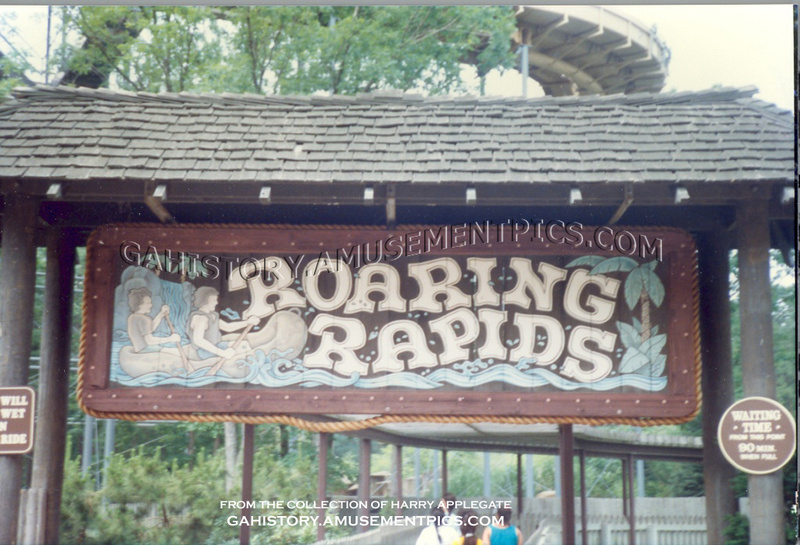 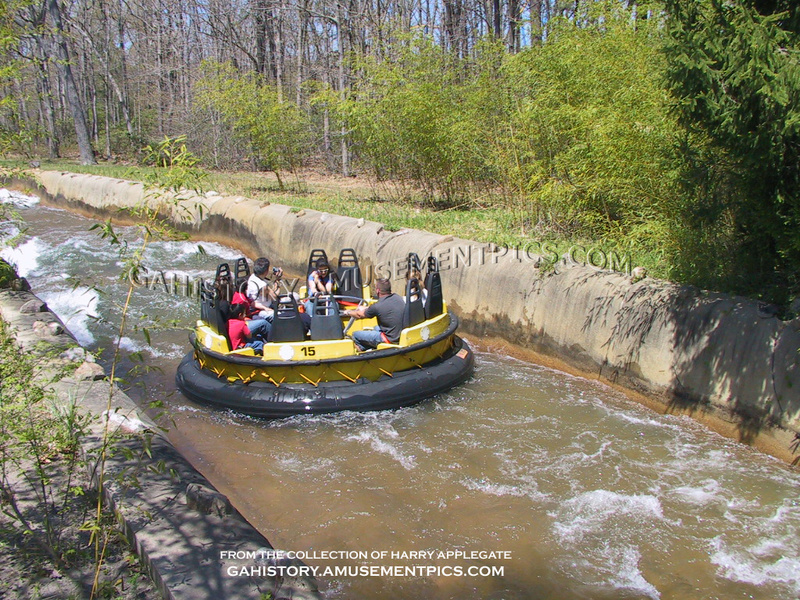 Roaring Rapids was constructed over the winter of 1980-81 and made its debut in June of 1981, as one of the world's first river rapids rides. 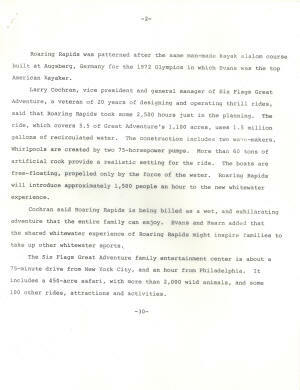 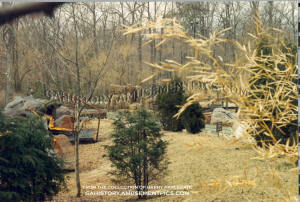 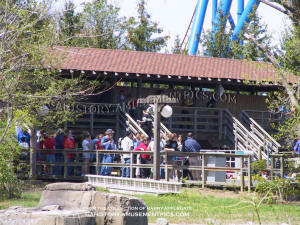 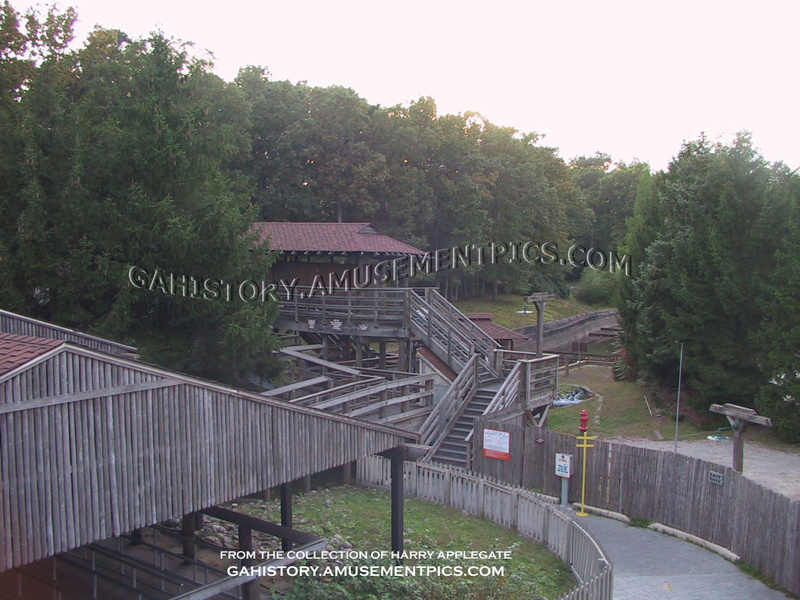 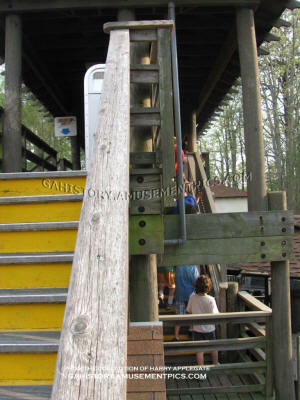 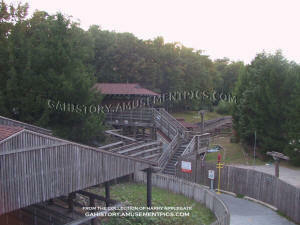 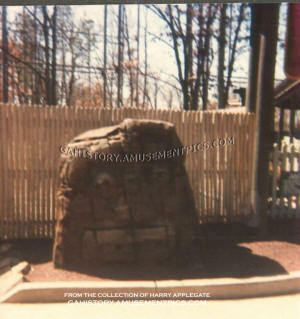 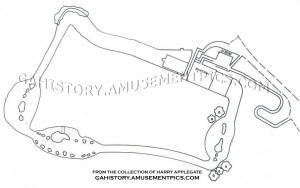 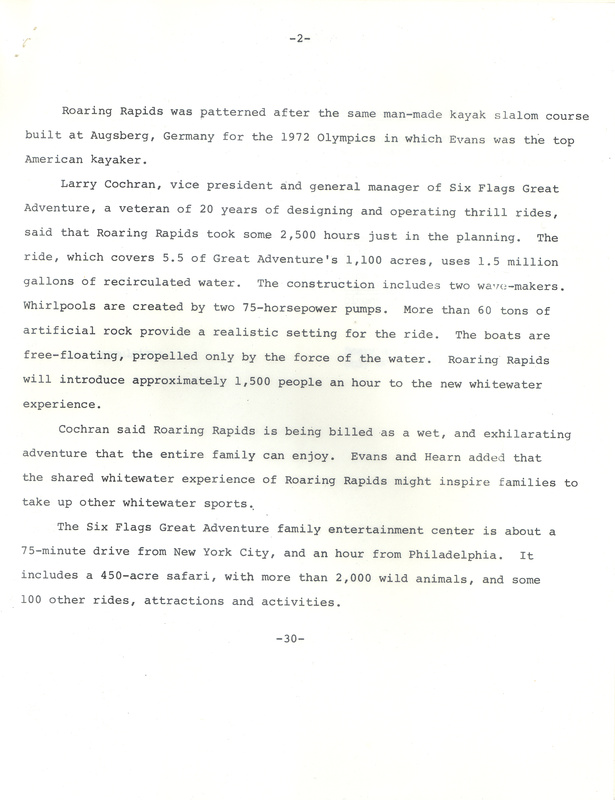 The ride was built at the farthest end of the park, behind Lightnin' Loops, in a previously undeveloped area of woods. 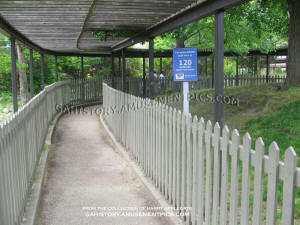 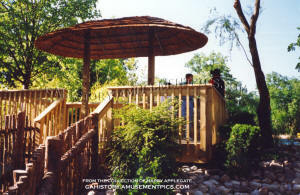 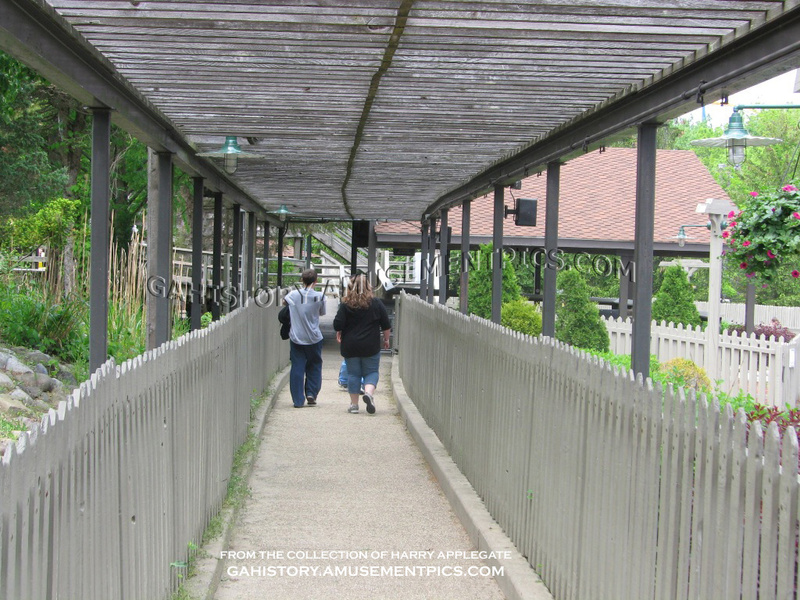 As part of the construction, a gift shop and snack bar were constructed along the pathway. 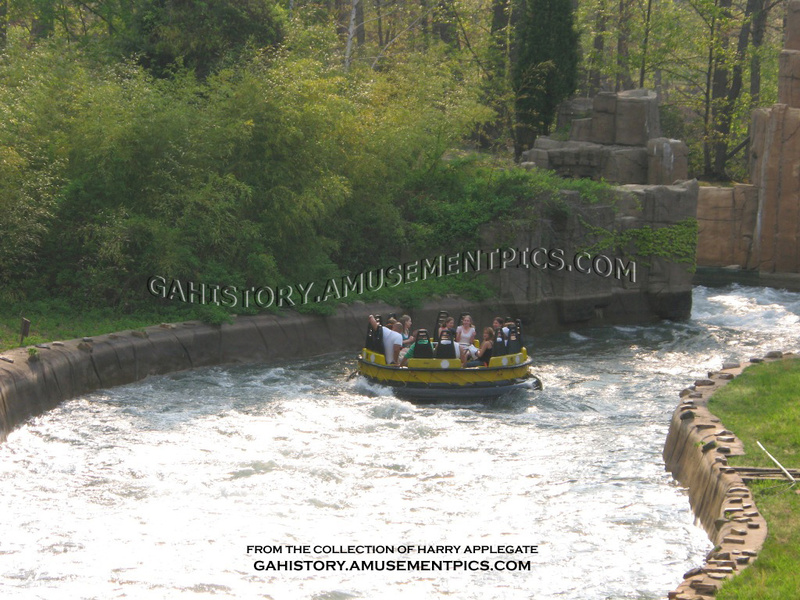 The ride uses gravity to propel the boats along the course, with a 12 foot drop in elevation creating the current. 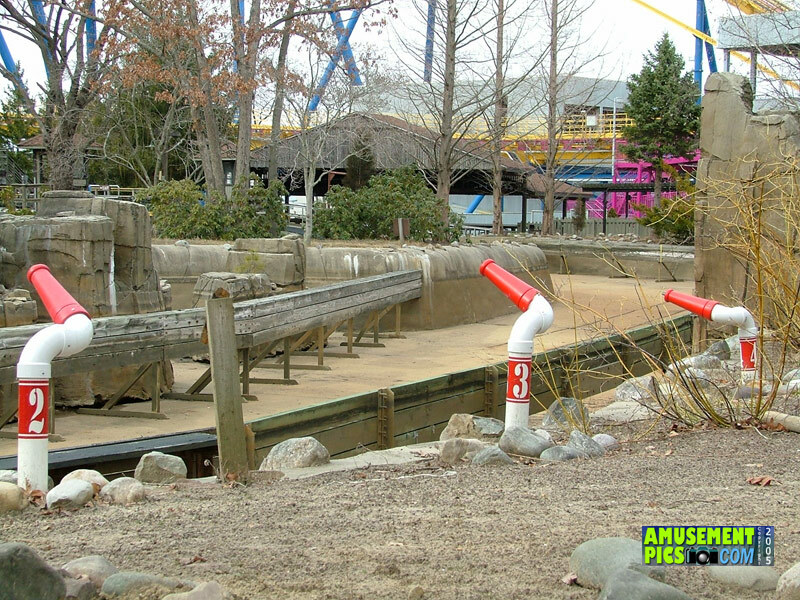 Huge pumps at the ride station pump the water from the low point at the end of the course to the high point where the boats are launched. 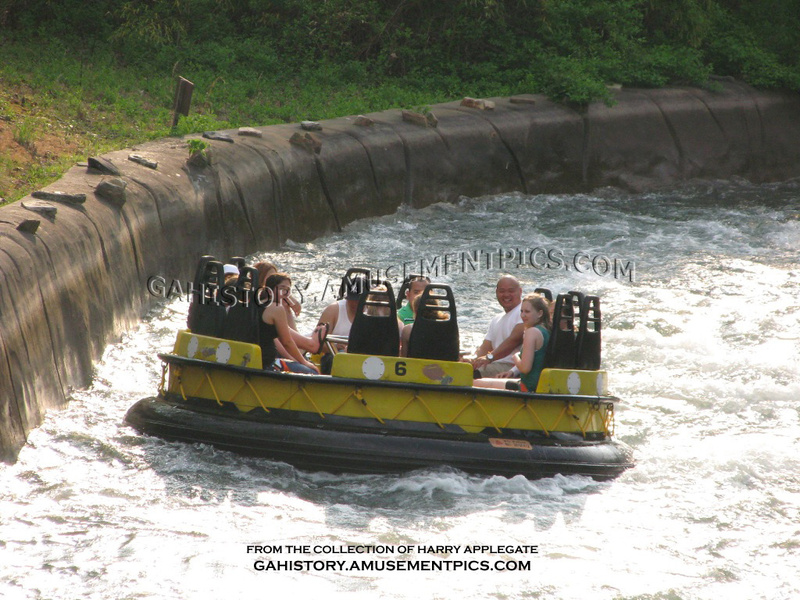 Along the course of the ride there is a wave making machine on the first leg, followed by a succession of rapids created by the fast currents in the back section. 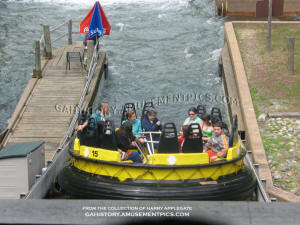 Another wave machine sits in the back corner of the ride where the current slows again, then starts a succession of rapids as boats head toward the waterfalls in the front corner. 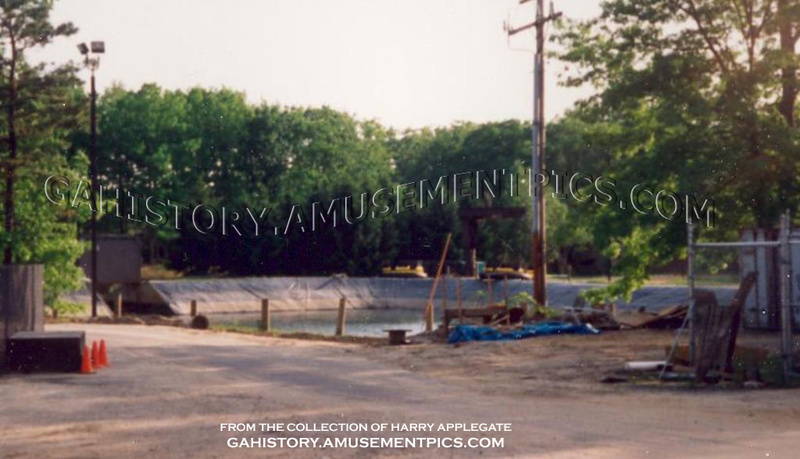 At the end of the course is the retention basin which also serves as a corral which holds boats not in operation, as well as holding the water when the pumps are not activated. 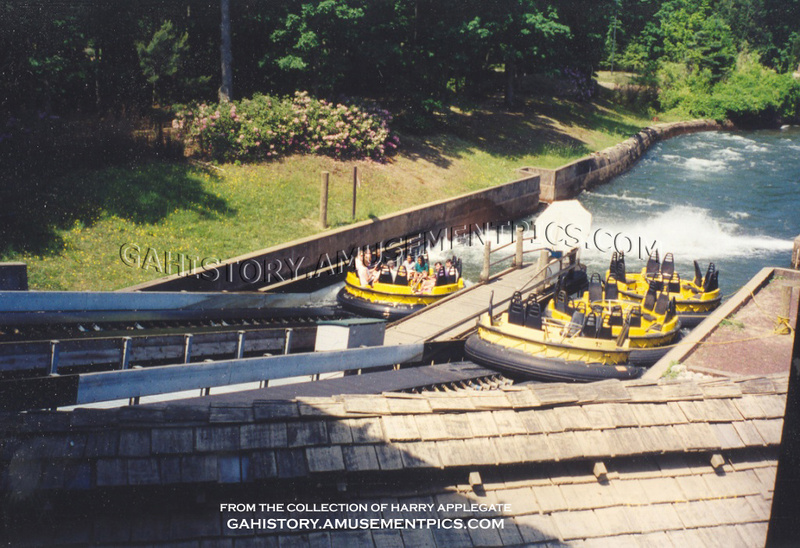 Boats are carried up to the high point of the ride at the station platform with a series of conveyor belts. 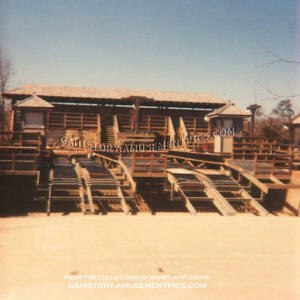 The station has twin loading and unloading platforms, and the boats are directed to one side or the other with a powerful water jet pushing them towards the appropriate belt. 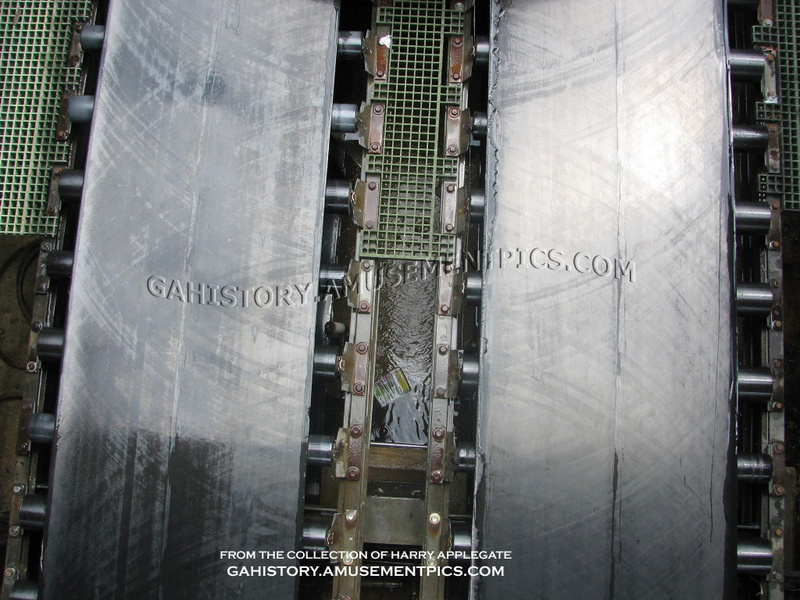 Within the station the belts are broken into blocks allowing multiple boats to be loaded and unloaded, and advance onto the river as they are ready to dispatch. 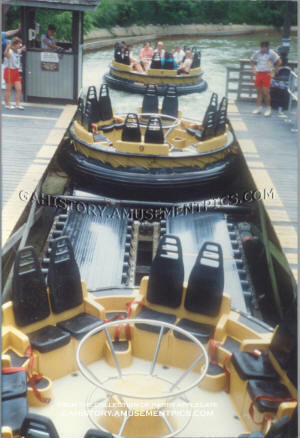 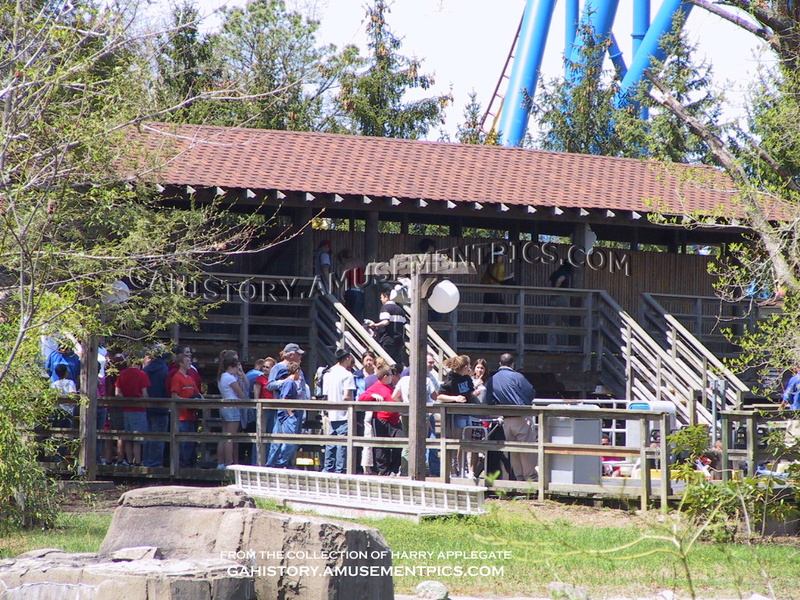 The ride requires a fairly large staff, with multiple attendants in the station as well as operators overseeing the loading/unloading and advancing of boats through the station positions. 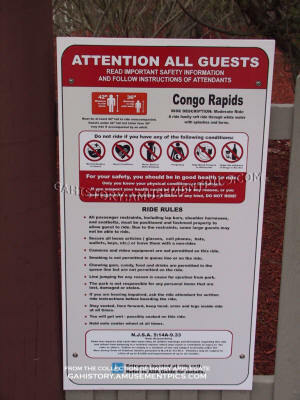 In addition, attendants are positioned along the ride route, monitoring the progress of boats and occasionally eliminating boat jams. 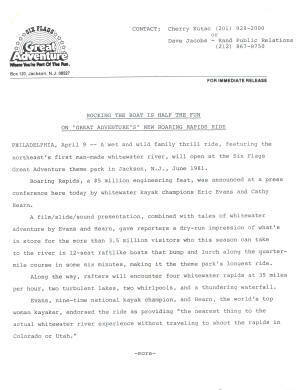 An excerpt from the article Some Great Adventure Plans Are All Wet published in The Press, Atlantic City dated January 30, 1982. 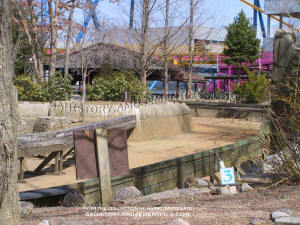 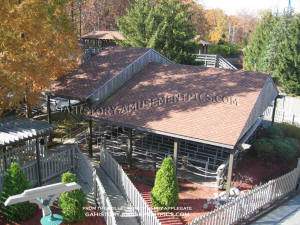 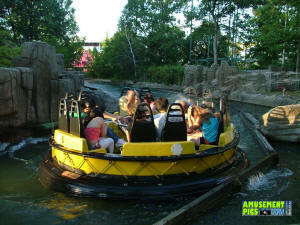 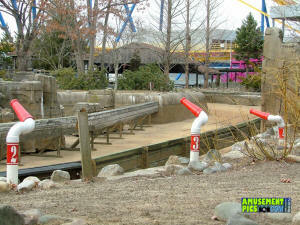 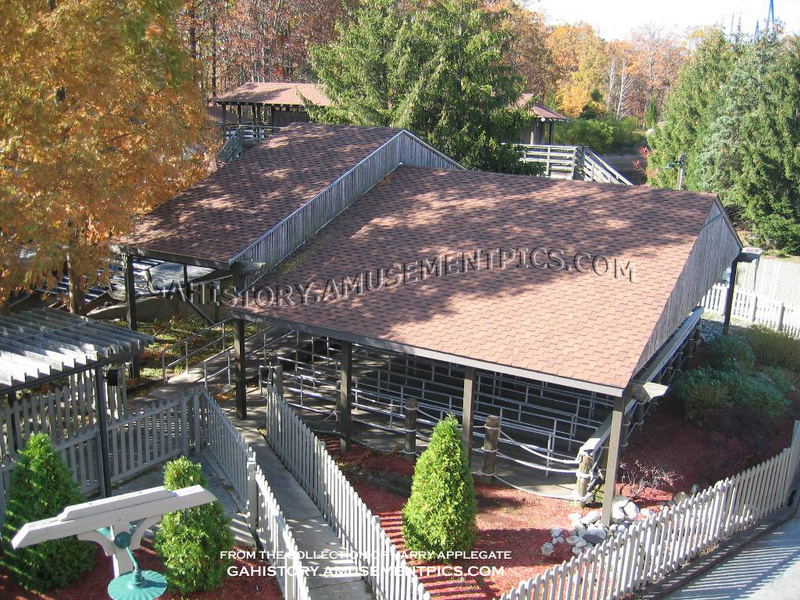 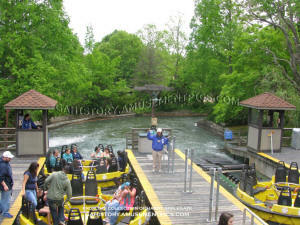 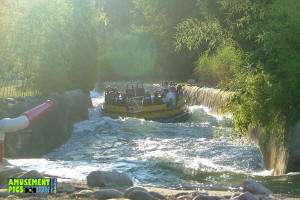 Some (changes for the upcoming season) involve the $3.6 million Roaring Rapids ride that opened last June. 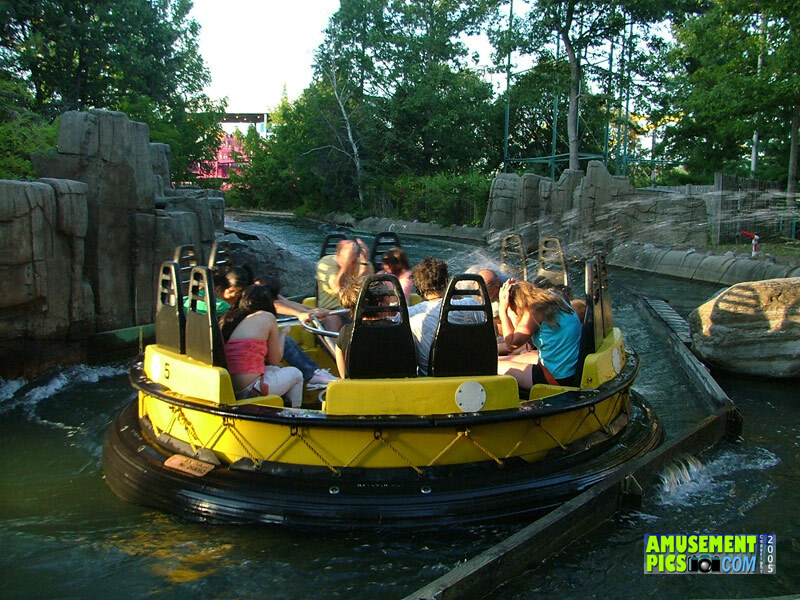 It seems that the park’s latest water ride had one specific fault: It failed to get everyone wet. (Park spokesman Robert) Williams said park officials found that patrons usually got in line for Roaring Rapids to get a break from the hot summer sun. But often the doughnut-like rafts, which drift for about five minutes over artificial rapids and past a waterfall, didn’t splash enough riders. 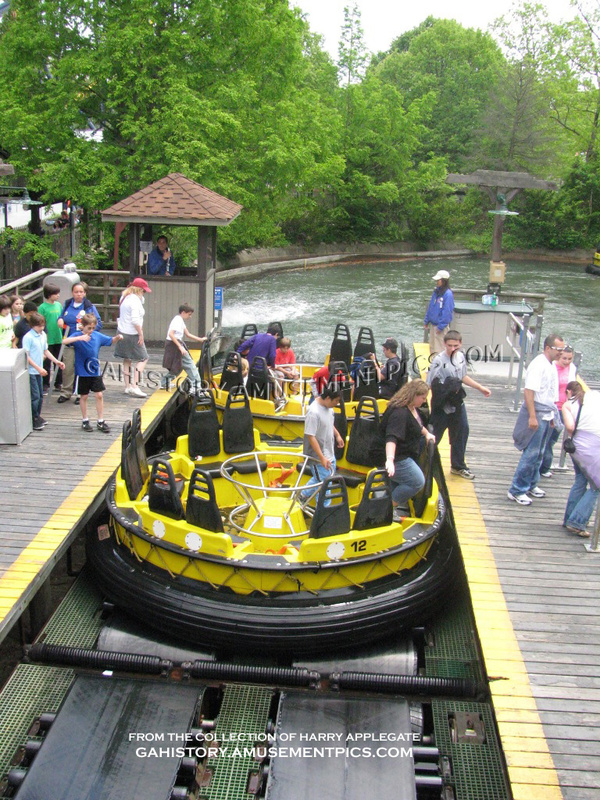 Many who failed to get wet came off the ride disappointed, according to Williams. Well that’s going to be changed. 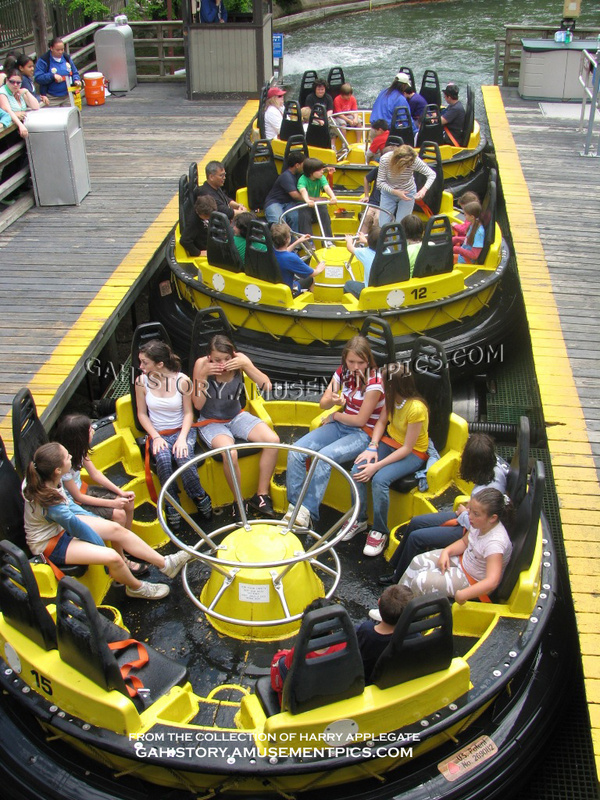 “This year, we intend to get everybody in the boat wet,” Williams said. 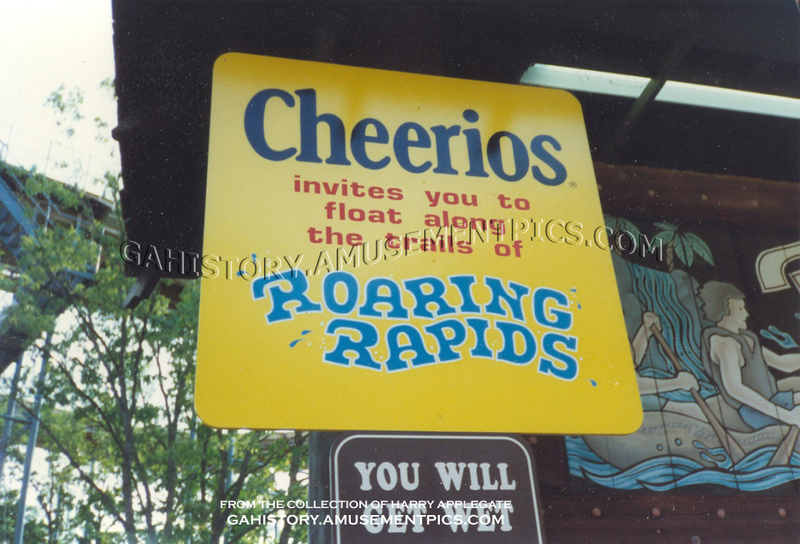 Improvements slated for Roaring Rapids include adding a few geysers with one concealed in a dark tunnel that will insure everyone gets soaked, Williams said. 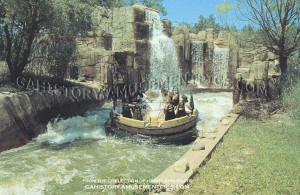 He said the park will spend a few hundred thousand dollars on Roaring Rapids alone. 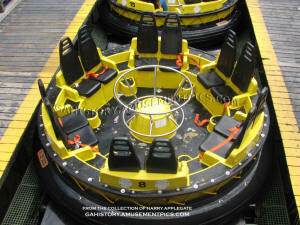 In 1988 more changes were made to improve ride safety, with the addition of the attendant block advance buttons on the docks and life rings along the river. 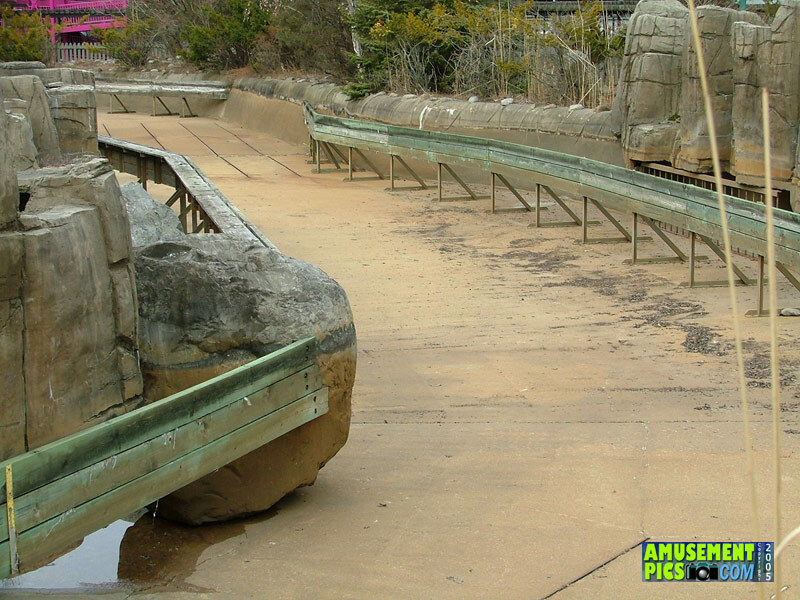 Walls of pressure treated lumber added a few years later to prevent boats getting caught between the rocks. 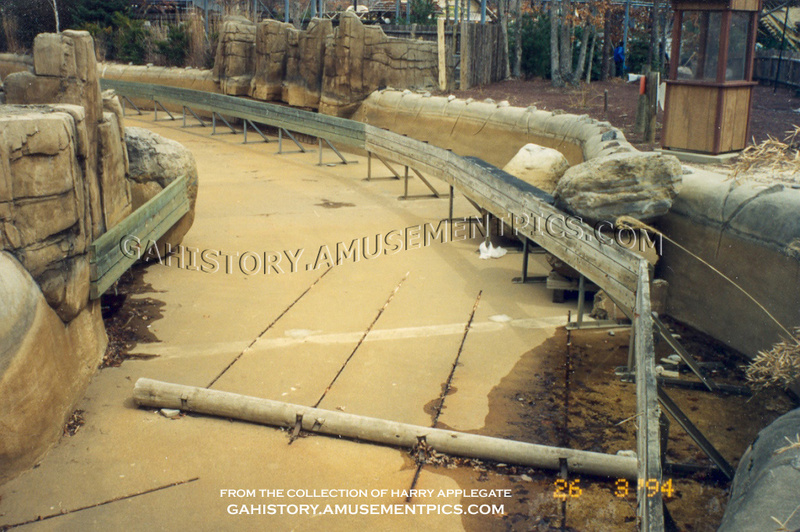 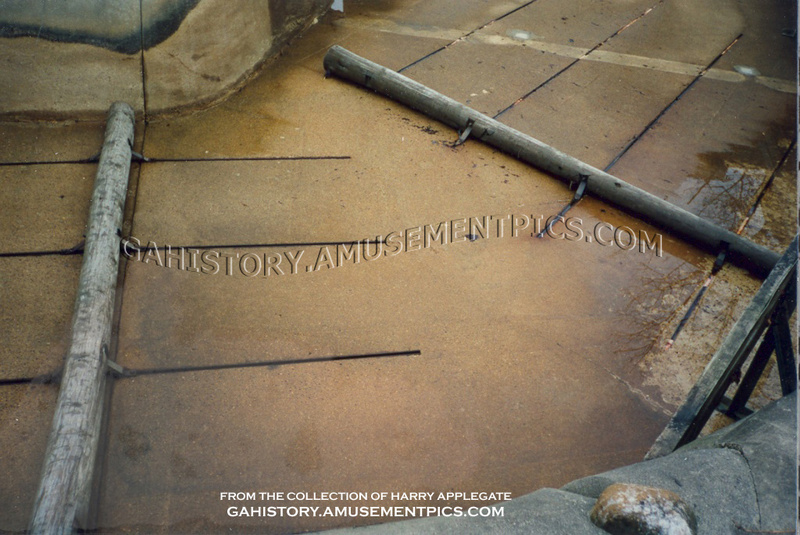 The wave machines were deactivated as well since they were rendered useless by the new walls. 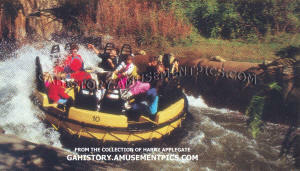 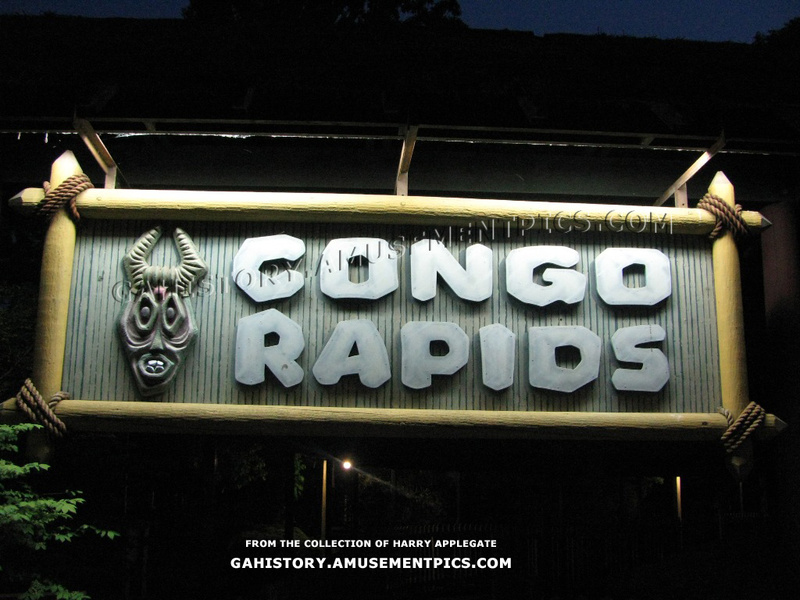 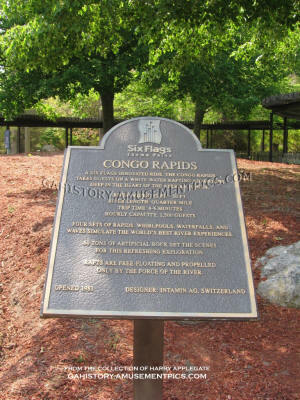 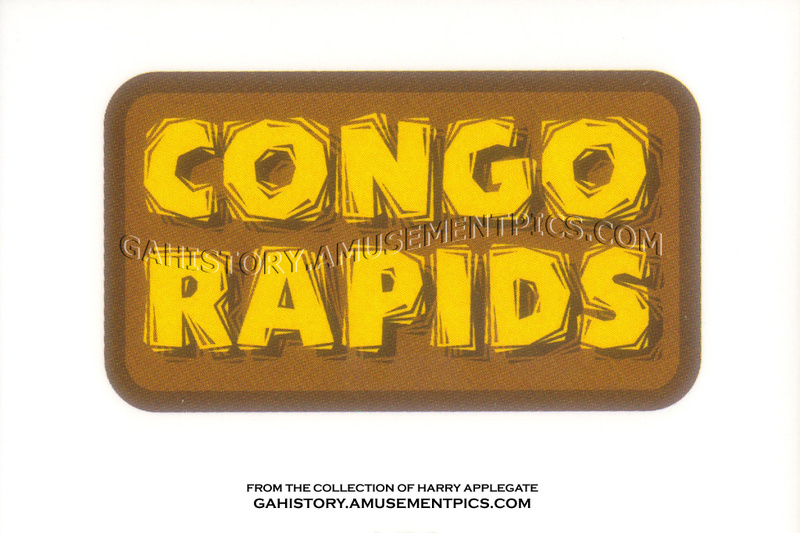 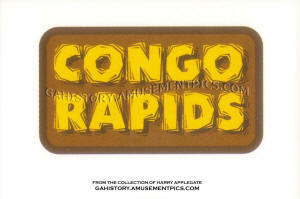 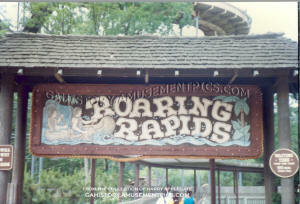 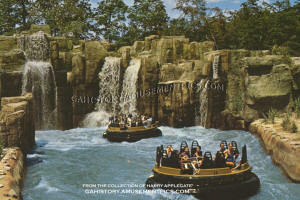 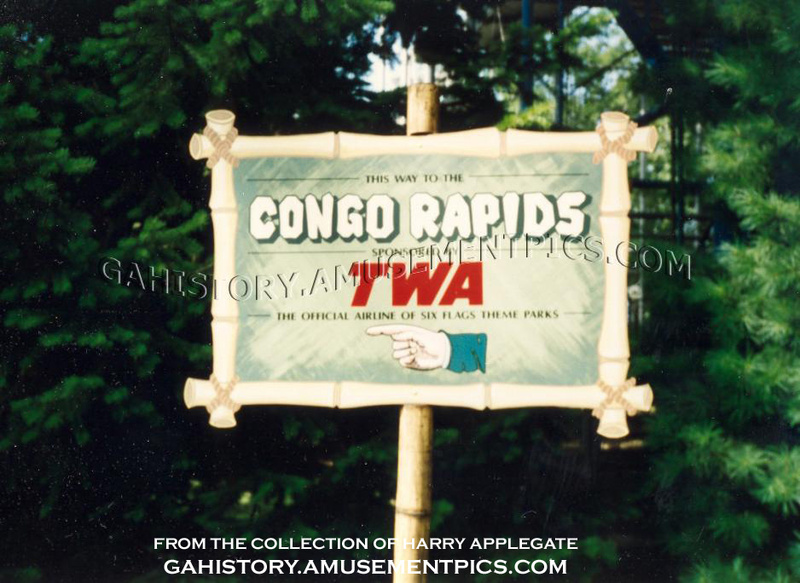 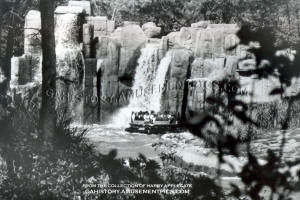 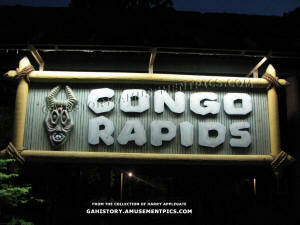 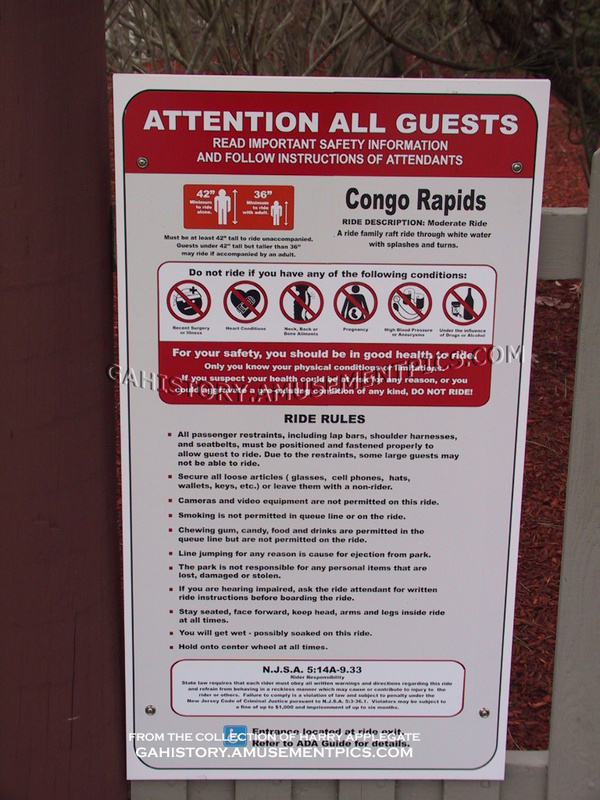 Over the years, Roaring Rapids was renamed Congo Rapids when it became part of the park's Adventure Rivers area. 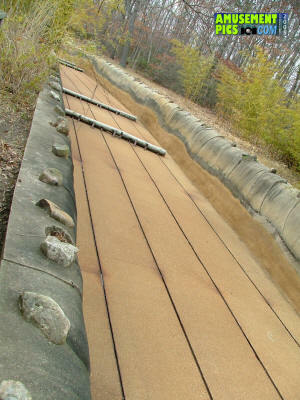 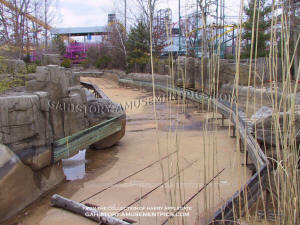 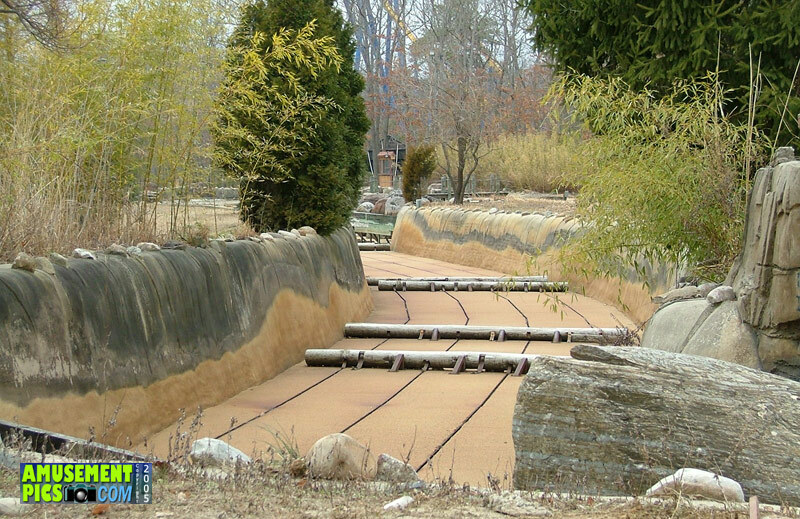 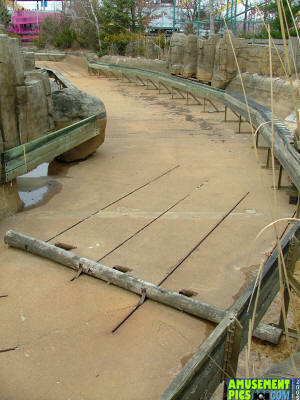 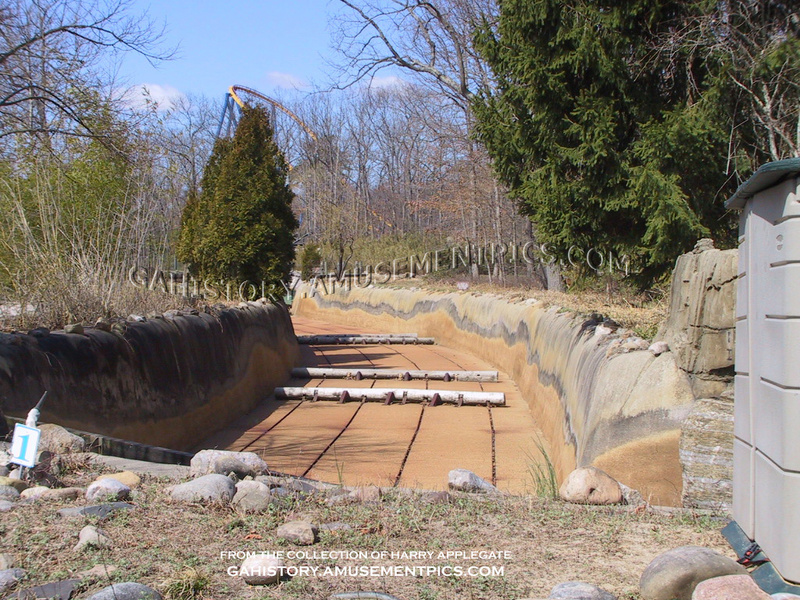 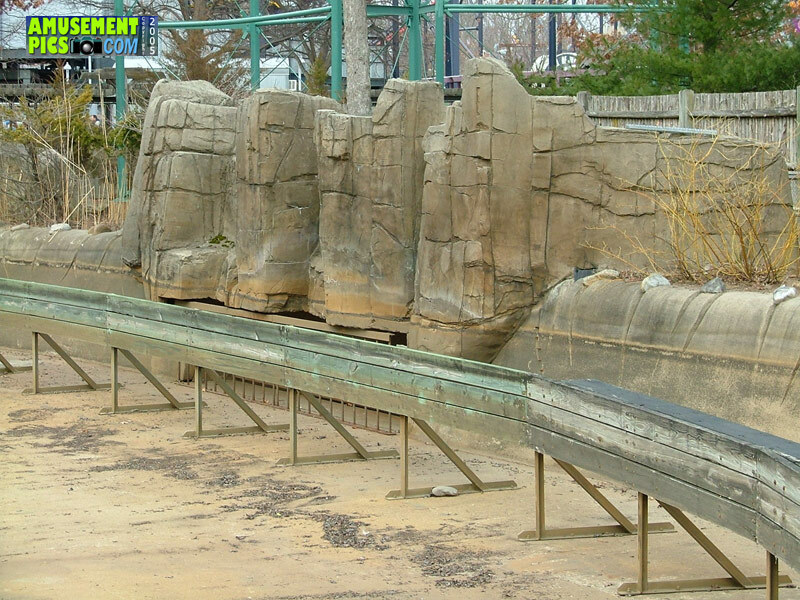 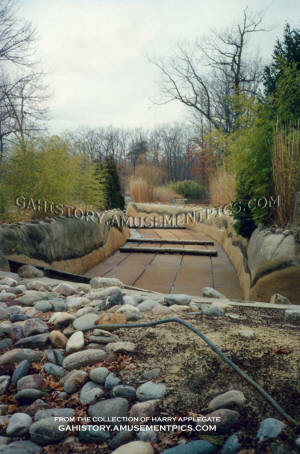 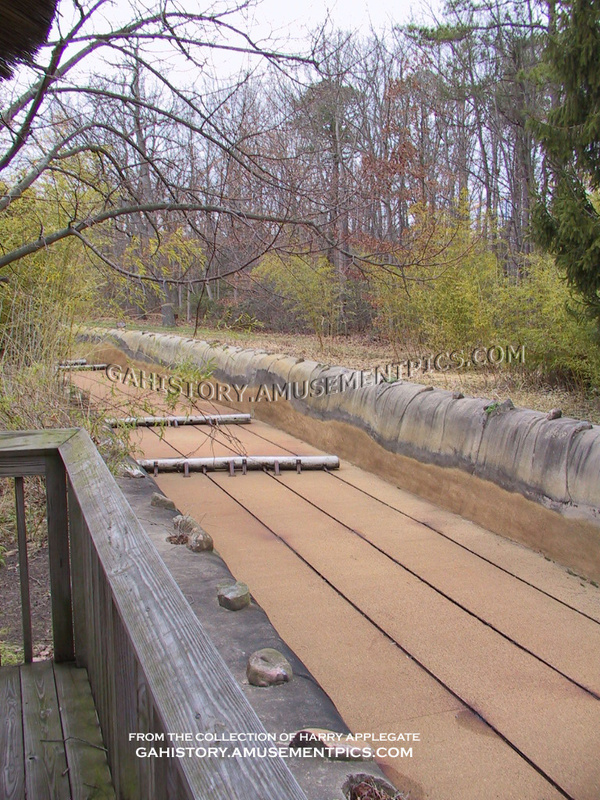 Part of the design of the ride includes steel tracks at the bottom of the trough that the logs which create the rapids along the course of the river are attached to. 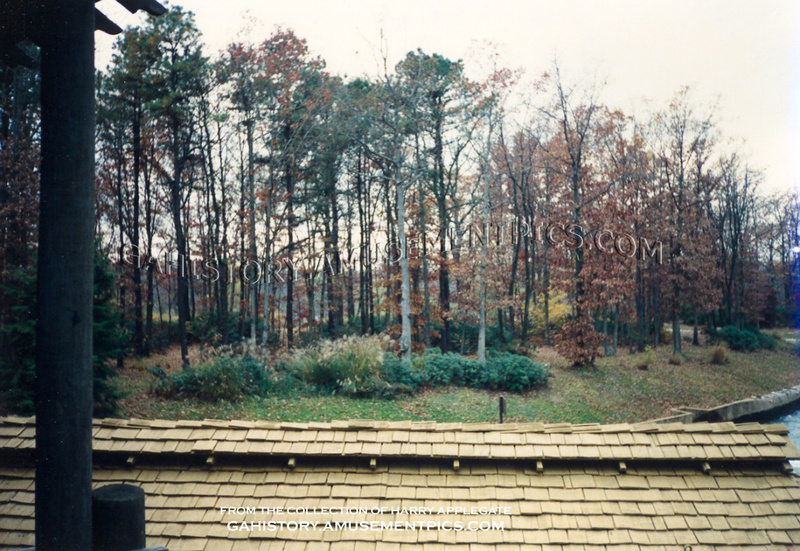 The tracks allow the logs to be adjusted to create variations in the current if necessary. 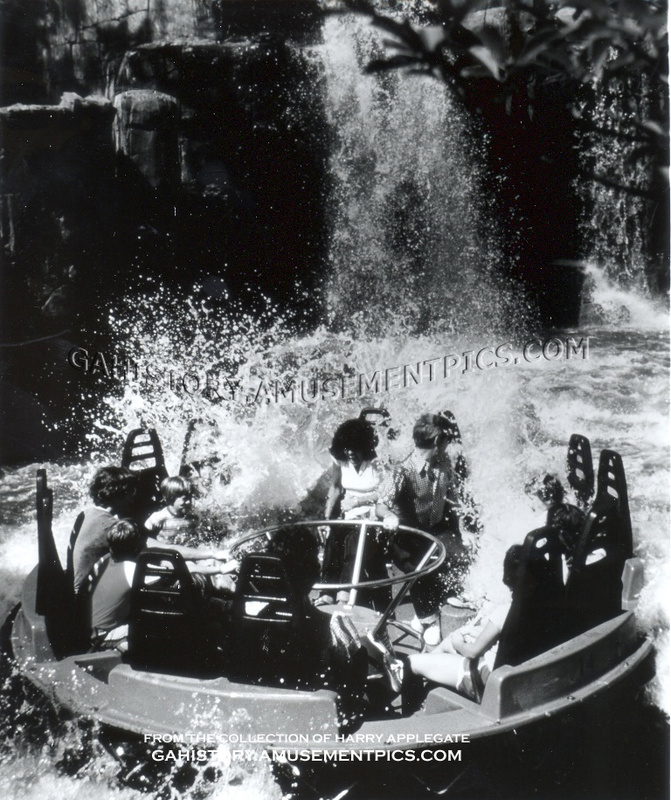 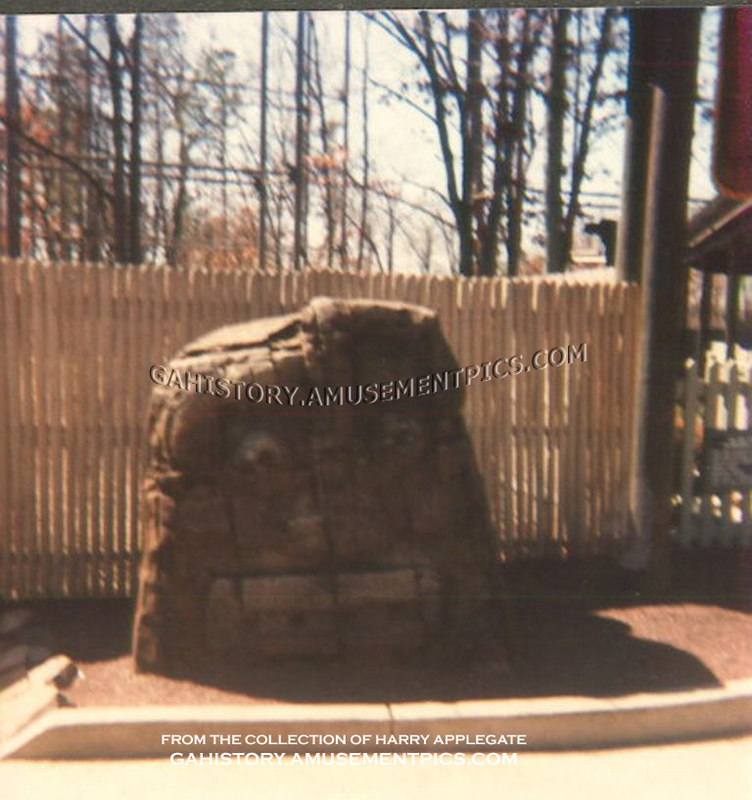 A later addition to the ride was a set of water jets which could be coin operated and offered another opportunity for riders to get wet. 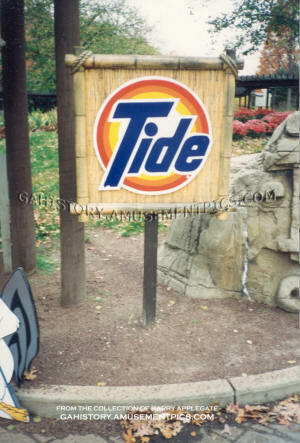 The water jets were located next to the ride viewing platform built as part of the Adventure Rivers expansion as the neighboring Koala Kanyon was built. 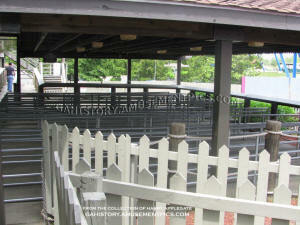 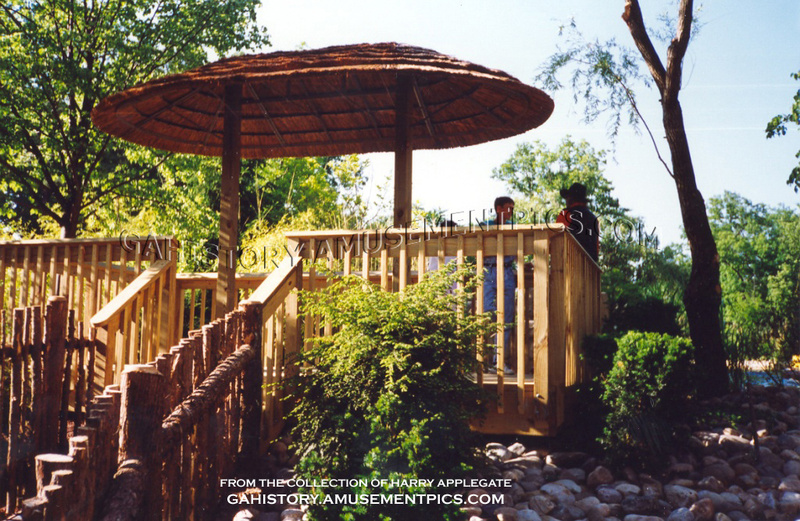 Another of the ride features which many guests got VERY familiar with was the queue which features a long and winding path covered with a pergola for shade. 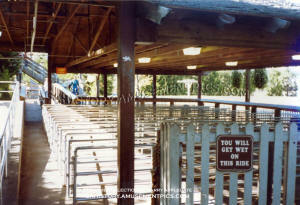 The original queue proved inadequate for the crowds the ride drew, with lines often extending as far as the Lightnin' Loops Cafe. 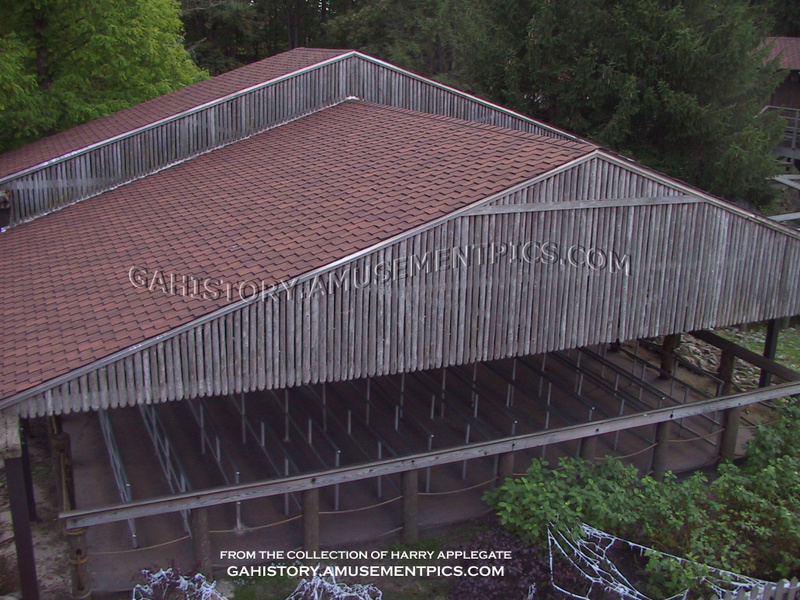 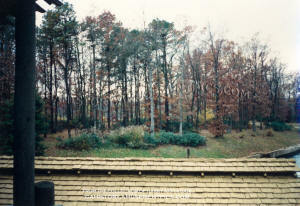 For the second season the large queue house was constructed near the station. 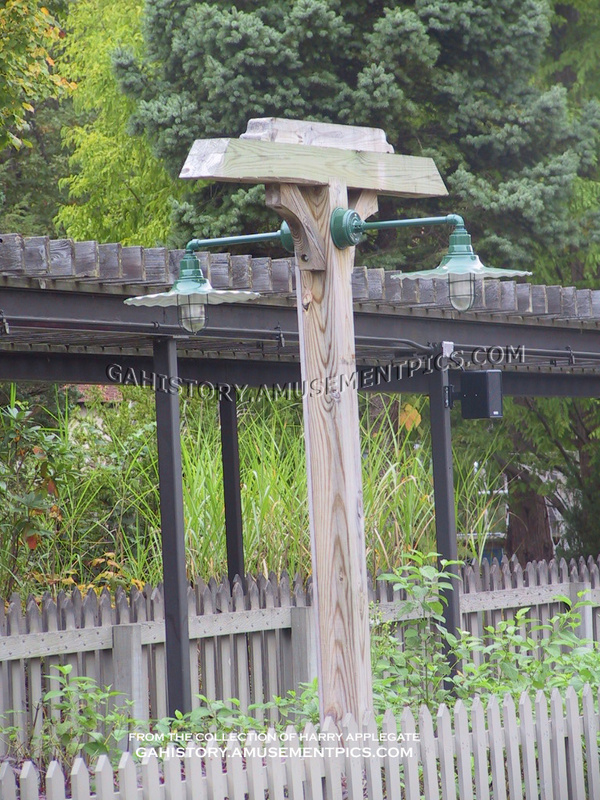 Lighting for the ride has been upgraded over the years with the original large white globe fixtures being replaced with ruffled metal shades. 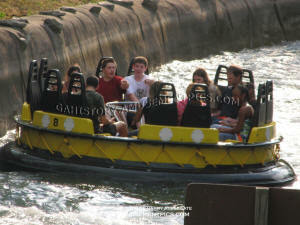 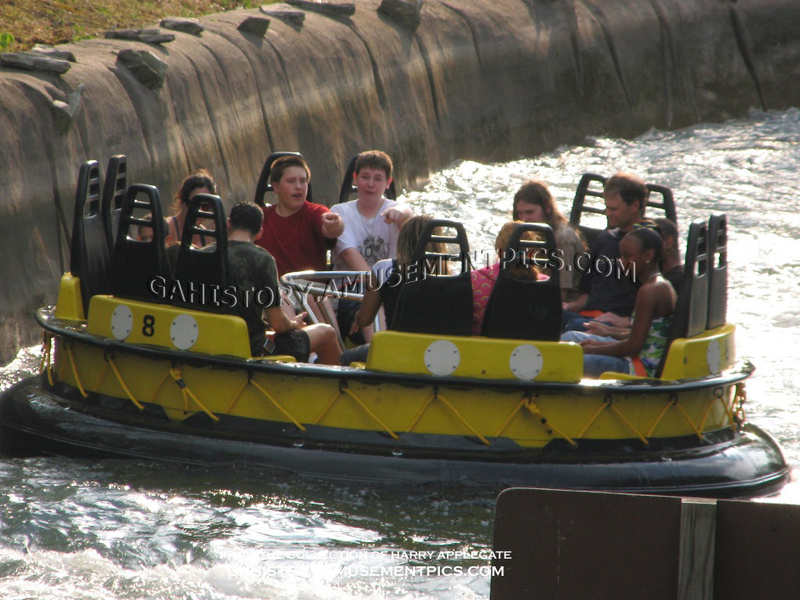 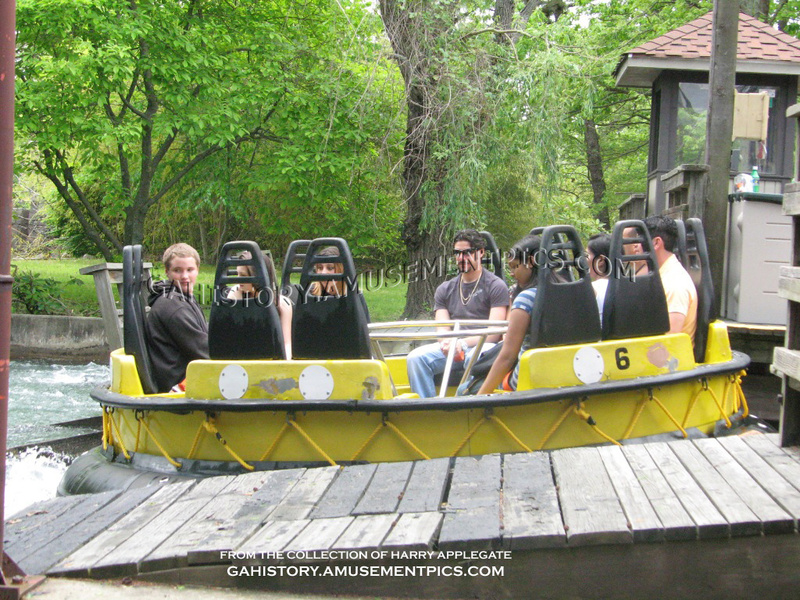 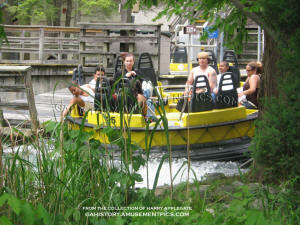 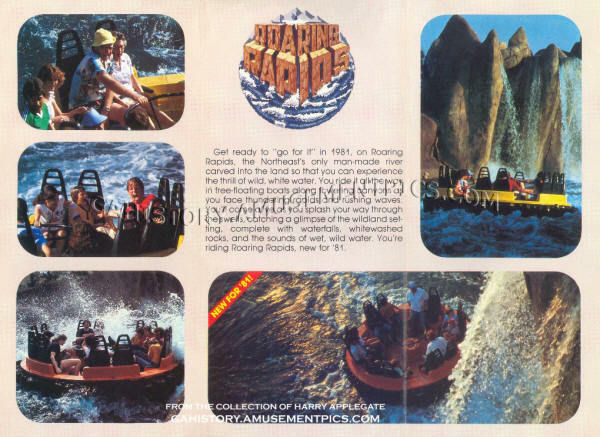 Top right, the Roaring Rapids crew always stood out in the park, being the only ride to have its own special uniform. Pictured here in the park employee newspaper The Good Ol' Summer Times, you can see the Safari style shirts. 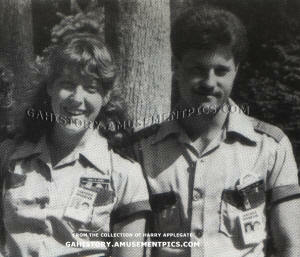 The uniforms also had matching pith helmets. 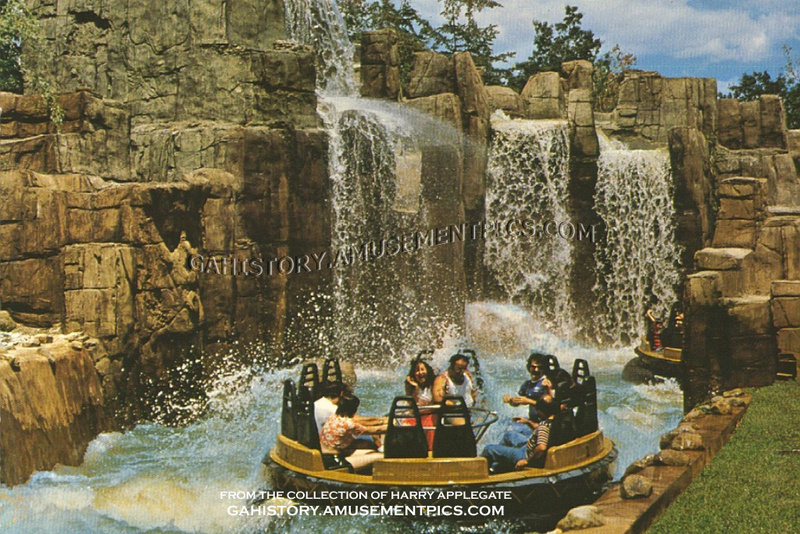 The Rapids crew was always looked on as the "cool" crew in the park since the guys were the only males in the park allowed to wear shorts at the time. 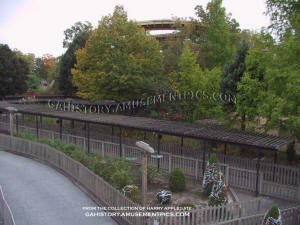 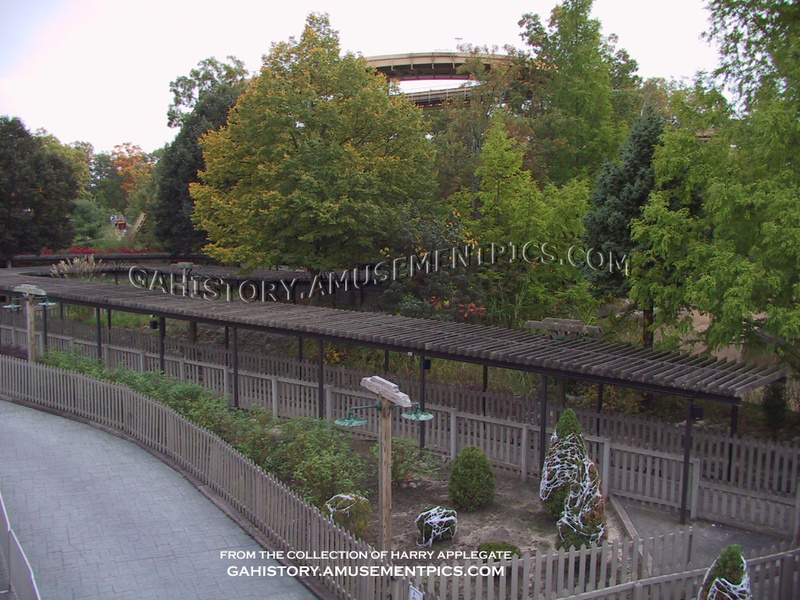 To the right you can see the lush landscaping of the queue from the platform of Lightnin' Loops. 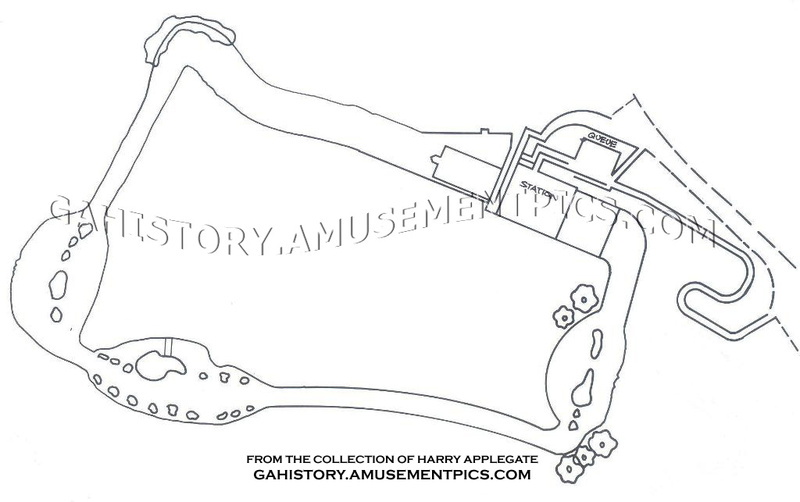 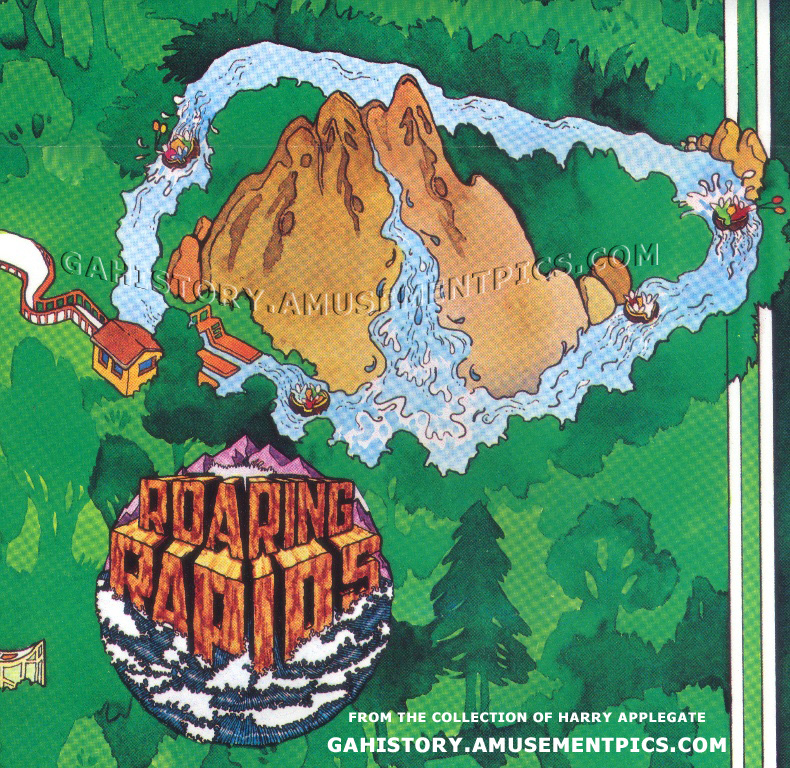 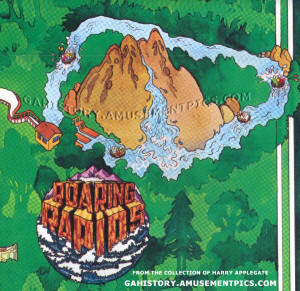 Lower left is the rendering of Roaring Rapids from the 1981 poster map. 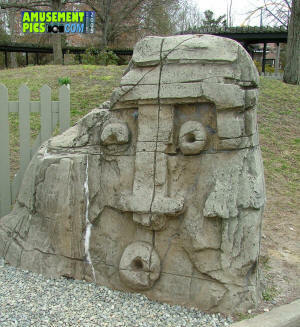 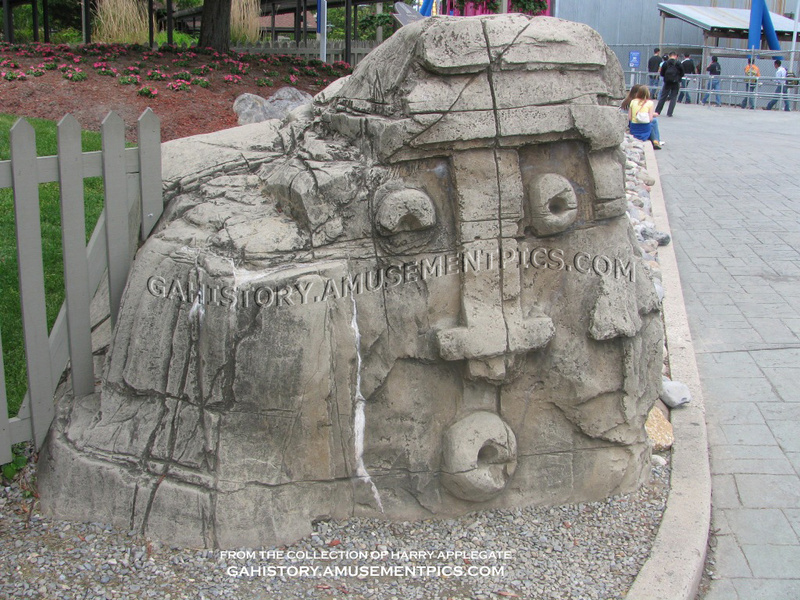 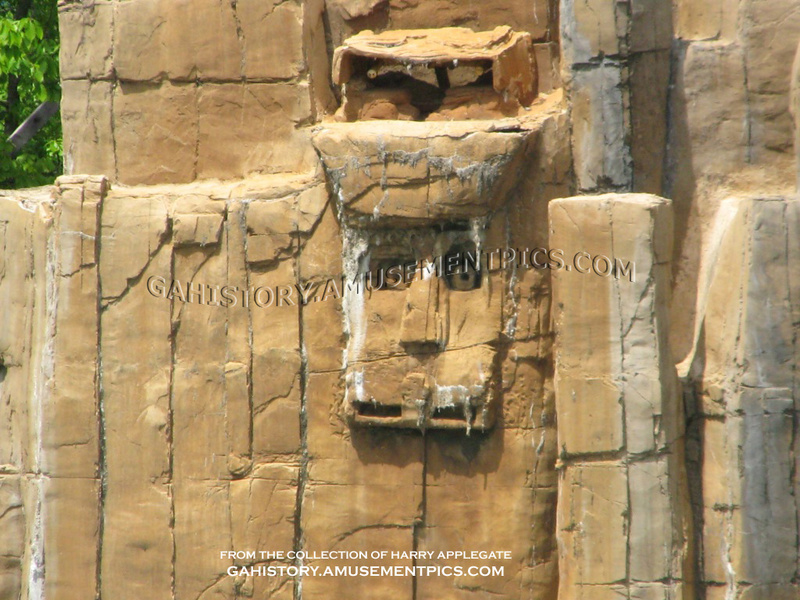 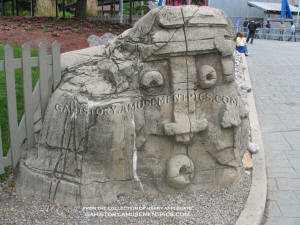 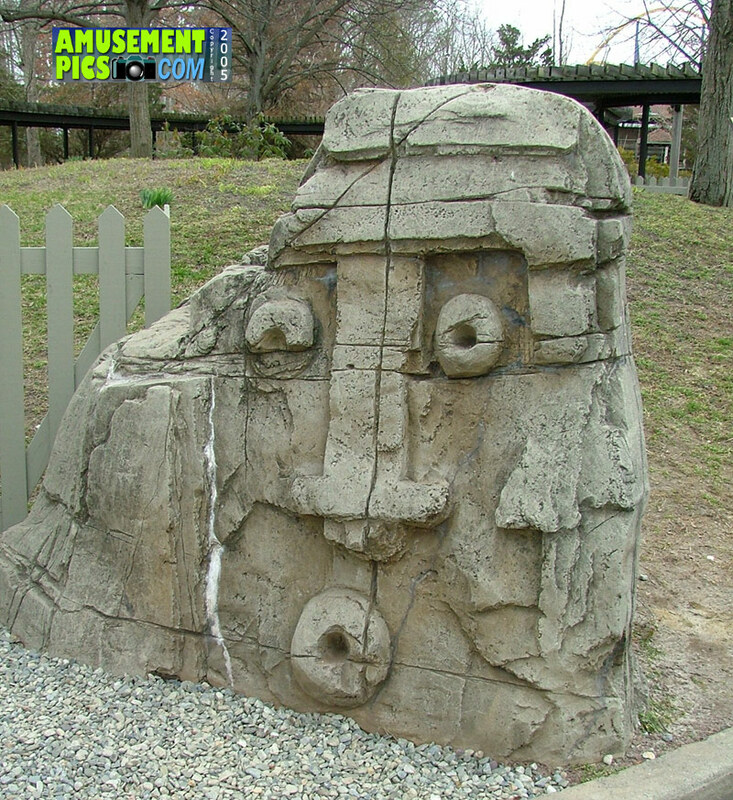 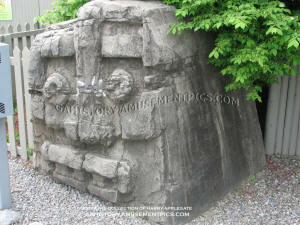 Lower right is the face that greets guests as they enter the ride queue. 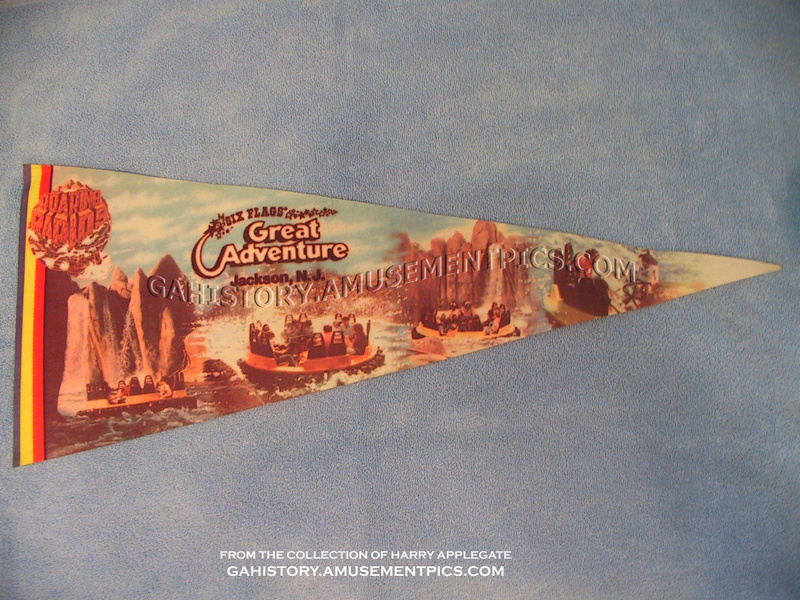 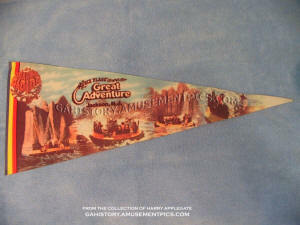 Below are some of the most popular souvenirs sold at the Roaring Rapids Gift Shop which included a boat shaped ashtray, a paddle, and a pennant. 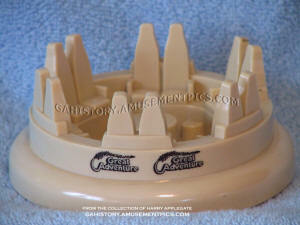 Both the ashtray and pennant feature park logos inherited from the original Thunder River at Astroworld, which had the trail of stars logo under Six Flags ownership.